Even though there is several weeks of winter to go and we cannot play outside, there are indoor tennis parties coming up for GCTA Members. We will take care of everything - balls, snacks, and courts divided by levels. You can enter drawings for gift certificates and you will get to see your friends from the summer leagues! All events take place at Racquet Club on 1100 Bethel Road from 6:00PM - 10:00pm. Please only register if you can make it to the party no later than 6:30pm. There will be round-robin play, and players will switch courts every half hour. The Ladies parties will take place on January 19 and February 9. Both are Saturday's. To insure that more women have the ability to play, participants can only play on one of the two dates. The Mixed party will take place on February 23. It is also on a Saturday. Both parties limit the number of participants so please sign-up quickly. Because the parties are first-come, first-serve, please only register yourself. For the Ladies Party, please choose ONE of the dates below. Providing all this information at once is very, very helpful! Please register now before all of the spots are filled. Central Ohio girls competed well at the state high school tournament. 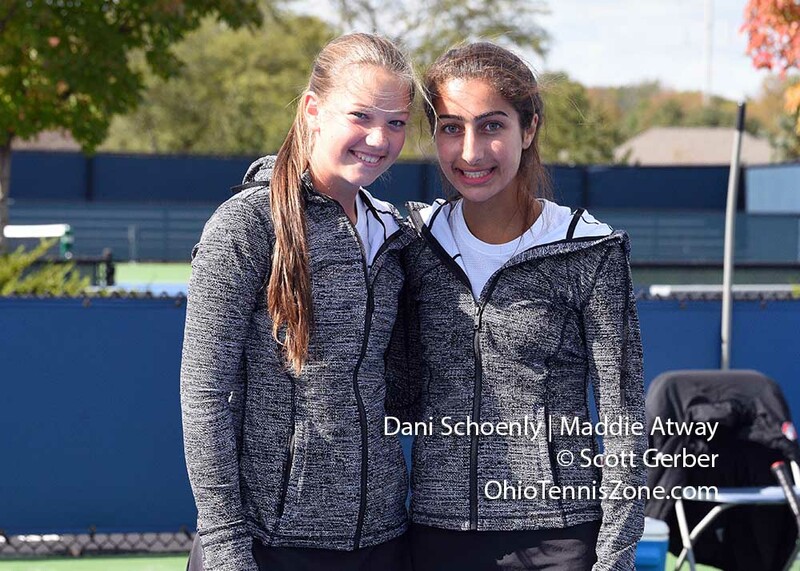 Olentangy Liberty's Dani Schoenly and Maddie Atway were the Division I State Doubles Champions. They were also the champions last year. Columbus Academy's Sydni Ratliff repeated as the Division II State Singles Finalist. The players representing central Ohio as state qualifiers are listed below. Click on the photos for the player names and for the schools that they represented. Olentangy Orange represented the Central District in the State Team Tournament and they finished fourth. Columbus Academy finished second in the state in the Division II State Team Tournament. 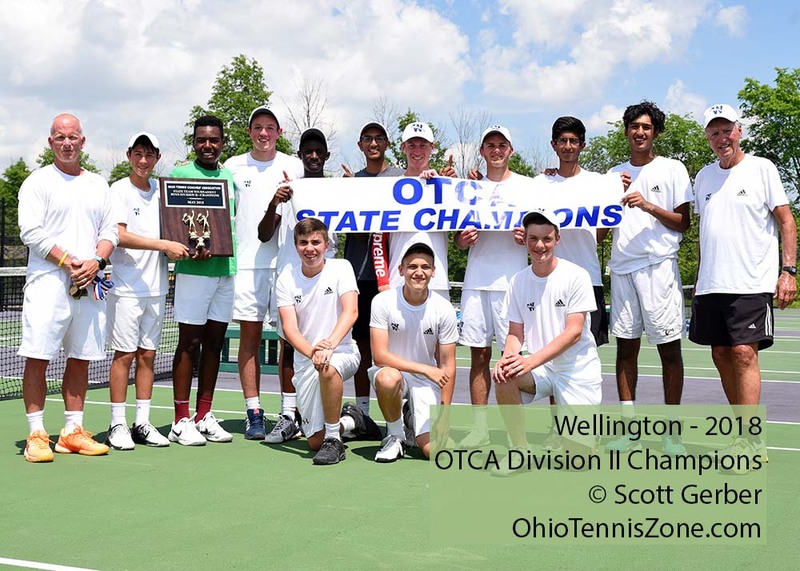 OhioTennisZone.com gave permission to the GCTA to use these copyrighted images on the GCTA web site. The links above take users to the OhioTennisZone web site. The GCTA Awards Banquet was held at the Everal Barn on September 13. The individual award winners are listed below. For photos of the team and individual award winners, click on Photos and Awards above. Columbus-area players competed in the Ohio Valley Cup Tournament, and once again, were victorious. This is the eighth year in a row that Columbus has won the title. It was held in Huntington, West Virginia on June 16 and 17. The team was led by Coaches Steve Metzmaier and Tyler Stephen. The players were: Rhyan Cook (Pickerington North), Erin Storrer (Olentangy Orange), Lala Nagireddy (Dublin Coffman), Ella Hazelbaker (Upper Arlington), Colten Clark (Lancaster), Stu Brdicka (Olentangy), Jordan Phelps (Olentangy Orange), and Alex Heiden (Olentangy Orange). This was a GCTA / USTA event. For a frame of reference, however, their high schools are included in the parentheses above. 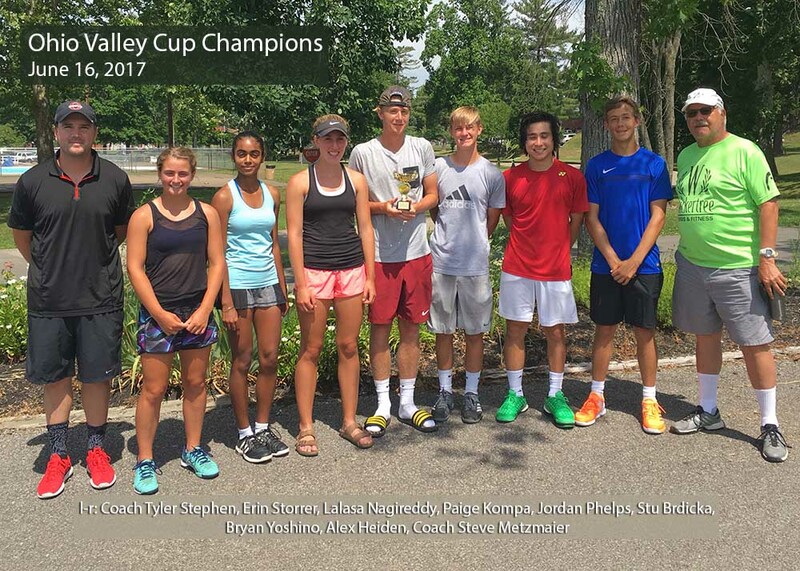 Click to read the "Tennis: Team Columbus captures Ohio Valley Cup" article written by ThisWeekSport's Frank DiRenna about the event. It is time to go to the refrigerator, grab a snack, and write down on the fridge calendar that the third annual Columbus Clay Court Championship is going to be here soon. Mark your calendar for August 10, 11, and 12th to join the fun. The Brookside Country Club will once again be the host site for the tournament. Women: 2.5, 3.0, 3.5, 4.0, 4.5, Gold, Platinum, and Open. Other divisions may be included based on the number of entries. 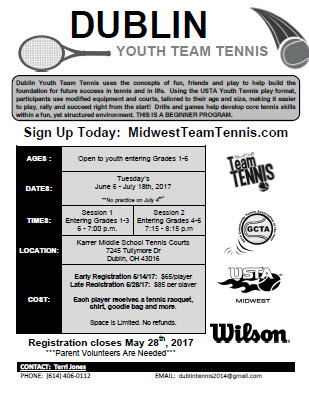 USTA Junior Team Tennis brings kids 10-18 years old together in teams to play singles, doubles and mixed doubles against other teams. It promotes social skills and important values by fostering a spirit of cooperation and unity, as well as individual self-growth. Also, it is a fun environment for kids in which they learn that succeeding is really more about how they play the game – win or lose. The Central Ohio Boys performed great at the state high school tournament. 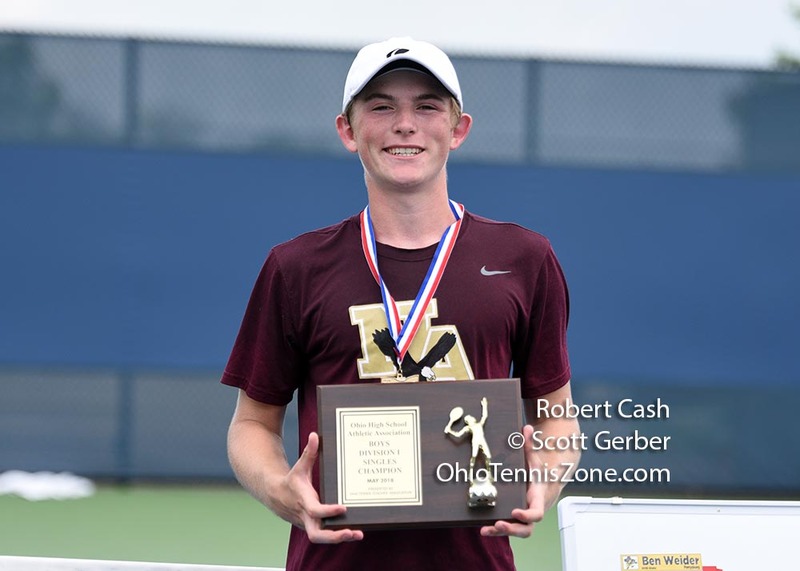 In Division I, New Albany's Robert Cash was the State Singles Champion and New Albany's Nathan Jose and Devin Boyer were the State Doubles Champion. St. Charles' Jack Dabek and Reese Yakubov were finalists. 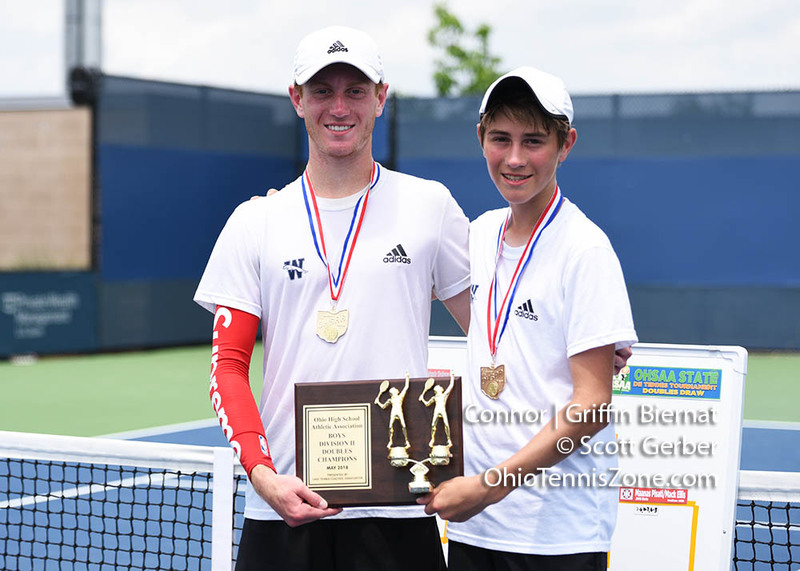 In Division II, Wellington's Biernat brothers, Connor and Griffin, were the State Doubles Champions. Wellington's Trevor Ball was the finalist in the state singles tournament. In the State Team Tournament, Wellington earned the Division II Championship. New Albany placed second in the state in the Division I State Team Tournament. The players representing central Ohio as state qualifiers are listed to the right. Click on the photos for the player names and for the schools that they represented. OhioTennisZone.com gave permission to the GCTA to use these copyrighted images on the GCTA web site. 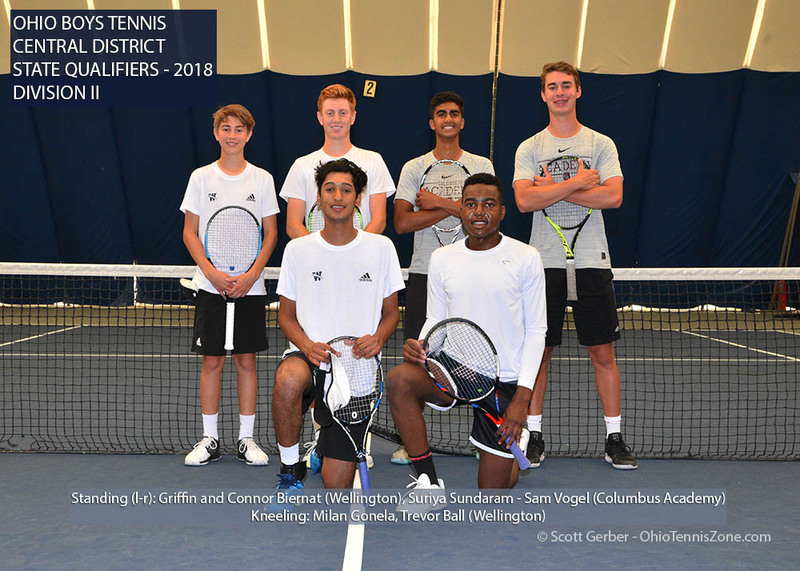 Columbus City League players and coaches once again benefited from a generous grant from the Greater Columbus Tennis Association (GCTA) this year. This grant enabled players from the Columbus City Schools to receive six indoor sessions to work on a variety of tennis drills. The program ran from January 24th to early February 28th and it was held at Olympic Indoor. All levels of boys and girls were welcome and an anonymous donor provided many of the kids with racquets that they could use. The number of players ranged from 18 (on the 5 inch snow day) to 26 during the program's six week duration. Schools who had players attending included: Beechcrot, Centennial, Whetstone, West, Linden-McKinley, and and Columbus Academy High School (CAHS), and Metro. Click on the picture to view the players in more detail. The program was run again this year by Karen Eldredge. Eldredge (shown on the far right in the picture above) is a tennis and pickleball enthusiast and mother to a Whetstone / Columbus Metro graduate. City League coaches who regularly volunteered included: Bruce Duffner (West), Daphne Hess (Beechcroft), and Patrick Harsch (Whetstone JV). Other coaches offering assistance included Steve Cudney (Linden-McKinley) and Barb Stevenson (Centennial). Coaches Hess, Duffner, and Cudney also provided players with transportation to and from the practice. Olympic Indoor pro, Bob Gordon, was the paid pro who assisted. The GCTA provides grants to many deserving programs. This grant totaled $1,577. For more information about grants, click on GCTA.net. Participants of the GCTA Summer League are invited to a free mixed doubles indoor pre-season party! The GCTA will take care of everything, including balls, snacks, and courts. There is room for *only* 40 women and 40 men so please register soon. All will be divided by level of play among the courts. Each rotation will be a half hour of play using the no-add scoring system. When not playing, participants can relax with friends and enjoy the snacks. Even though there is several weeks of winter to go and we cannot play outside, all Women participants of the GCTA Summer League are invited to a free round robin indoor preseason party. We will take care of everything - balls, snacks, and courts divided by levels. You can enter drawings for gift certificates and you will get to see your friends from the summer leagues! Both events take place at Racquet Club on 1100 Bethel Road from 6:00PM - 10:00pm. 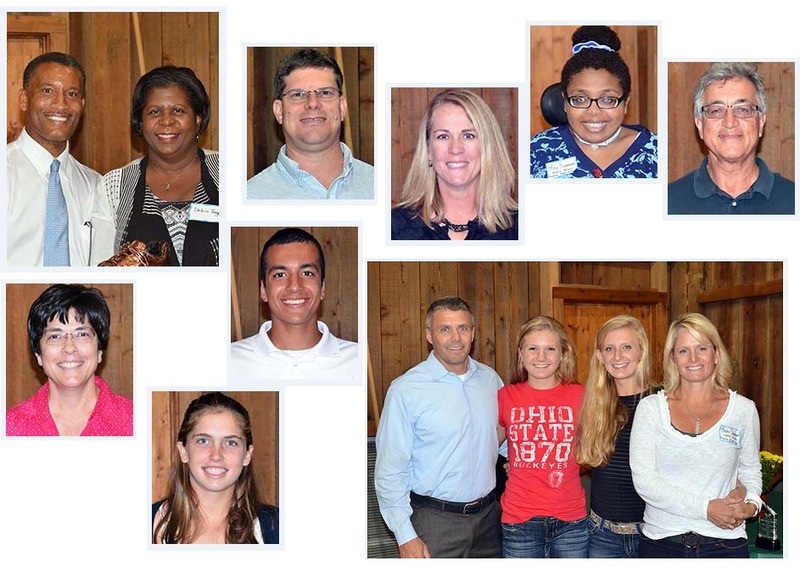 The Central Ohio tennis community gathered on the evening of September 28, 2017 at Westerville's Everal Barn to recognize this year's Greater Columbus Tennis Association's (GCTA) individual and team award winners. Click on 2017 Event Program to view all of the team award winners. Sharon Rusk was also recognized by the GCTA by renaming the group's Lifetime Achievement Award to the Sharon Rusk Lifetime Achievement Award. The 115 people in attendance enjoyed the chicken buffet dinner that was provided by Catering by Scott. Sponsors of the event included: Signature Dermatology; Fitness Matters, Inc.; and Woodland's Backyard. The printing of the program was courtesy of Rena Richied at Harper Engraving & Printing. To view photos from the event, click on GCTA Photos for 2017. 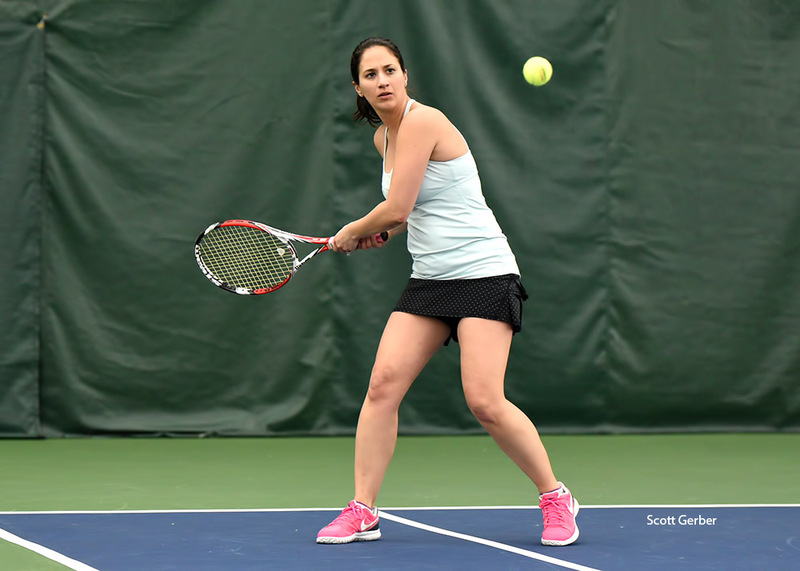 The Greater Columbus Tennis Association Clay Court Championship was held from August 11 - 13 at the Worthington Hills Country Club and the Brookside County Club. This third annual event featured great play and dryer weather than in previous years. The Saturday evening GCTA membership party at Brookside was also a success. It featured music from the Blue Cats, a three piece blues-jazz band. Thanks to everyone who came and participated. The Columbus Clay Court Doubles Championship and Greater Columbus Tennis Association (GCTA) Membership Party is right around the corner. The tournament takes place from August 11 to 13. The GCTA Membership Party is on Saturday, August 12 at 5:00pm. The deadline to register for the tournament and/or the party is Monday, August 7th. The event will take place at Brookside Country Club, 2770 West Dublin Granville Rd. Columbus 43235. There will be seven women's and eight men's divisions to accommodate a wide range of skill levels. We have added a mixed doubles division this year! The cost to participate is $20 for GCTA members and $35 for non-GCTA members. Click to register for the tournament. Note that your team needs to register by August 7th. The GCTA Membership Party will follow tournament play on Saturday, August 12. Click on RSVP to register for the party. Please include the names of the attendees under Comments. The Blue Cats, a three piece blues-jazz band, will perform at the Membership party between 6 and 9pm. The band includes the GCTA's own Terry Finneran. There will be a cash bar and grill available. There will also be complimentary bar snacks (such as nuts, pretzels, salsa and chips). The party is free for GCTA members. Again, please RSVP for the party by August 7th. Summertime sees GCTA in full swing. Our Men’s and Women’s leagues play 7 days a week. You can find the schedules for all of our teams’ matches at Tenniscores.com. Click for more information about the Men’s League. For the Women’s League, click Women. The picture to the right is of the Westerville Lazelle and Lakes Country Club 3.5 Career Teams as they prepare for a match. They are (l-r): (back row) Lisa Hartig, Pam Smith, Alica Brombacher, Chelsea Sharp, Becky Savage, and Gabrielle Ariser. (front row) Carrie Kramer, Alisa Disalvo, Holly Besold, Maria Crotty, Beth Jerauld, and Stephanie Mauger. GCTA is also in the midst of the Youth Team Tennis (YTT) season. This weekly activity introduces kids 10 and under to tennis with age appropriate equipment and fun, fast paced games. Currently we have 125 participants in Westerville, 50 in Dublin, 30 in Hilliard, and 95 in Southwest programs that run six weeks. Erin Ortman, Hilliard program director, says that Hilliard HS tennis players volunteer with the YTT participants, and encourage the youngsters to continue on with the sport into Middle School. 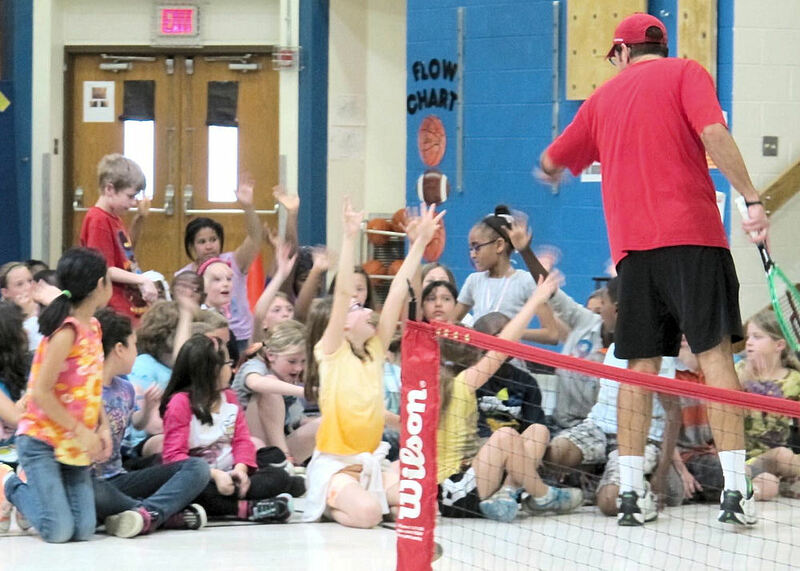 What a great way to introduce and get kids excited about tennis! Columbus Wins Ohio Valley Cup - 7 Years Straight! As the Columbus juniors competing for the Ohio Valley Cup can attest, winning never gets old. This group extends Columbus' winning streak to seven years. For those interested in being part of a USTA league, more information is listed in each of the flyers below. For any local questions, contact Susan Storrer at susanstorrer @gmail.com. More snow is probably still on the way, but don't let that prevent you from enrolling your children in great summer tennis tennis activities now. 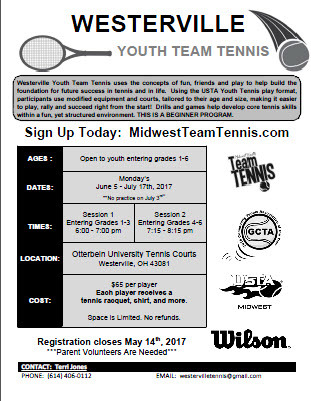 There is also a GCTA Middle School Summer Tennis League for grades 5-8. This will take place at the Westerville Central courts. Click for more information. Please sign-up quickly. These activities are very popular, and spots are limited. 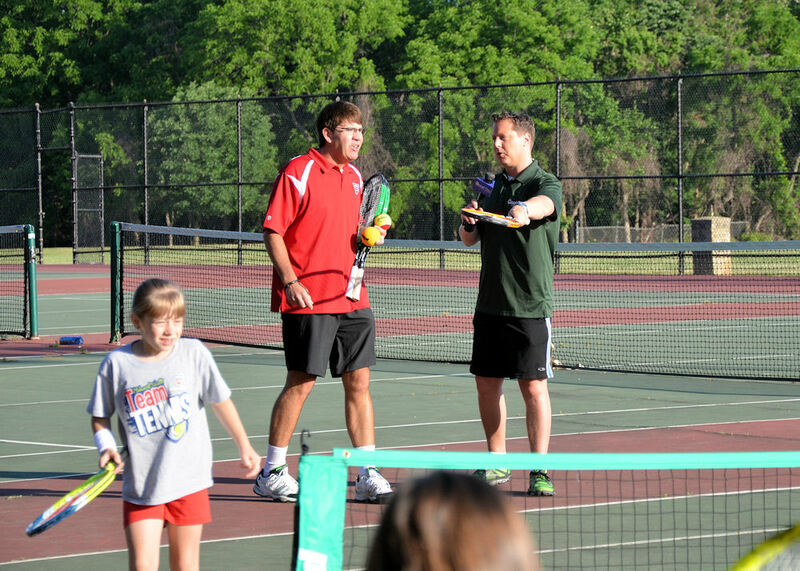 Summer tennis is still a few months away but that does not deter the GCTA from having several fun tennis activities. 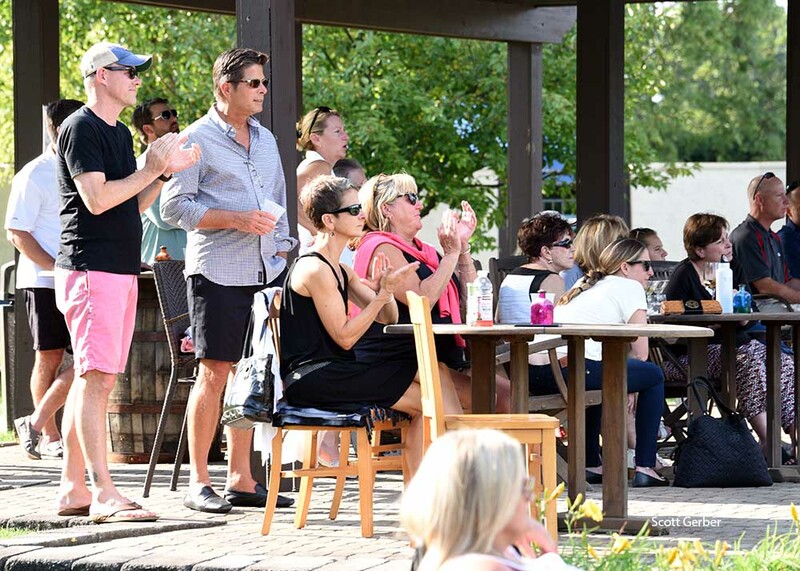 The Greater Columbus Tennis Association will have three tennis parties again this winter. There will be two Ladies parties - on January 28 and February 25. There will be a Mixed party on February 11. All of the parties will take place at the Racquet Club of Columbus on Bethel Road. Watch for emails with more details coming soon. If you are new to the area or if you are unsure if your name is on the GCTA mailing list, please submit a Feedback message. Please respond quickly after receiving the email. These parties are very popular and spots are limited. The GCTA Columbus Clay Court Championships are underway and matches are on-slate for this weekend. There are 55 men's and 40 women's doubles teams competing. To view the most recent results, draws, and start times, please click on the links in the table. Please note the following guidelines / rules for the tournament. Special thanks to Racquet Club for allowing play to resume on Sunday at their indoor facility. The rain would just not stop! Also a big "thank you" to our grand slam sponsor, Massucci Law Group. The GCTA Membership Appreciation Party and Awards Ceremony followed tournament play on Saturday. 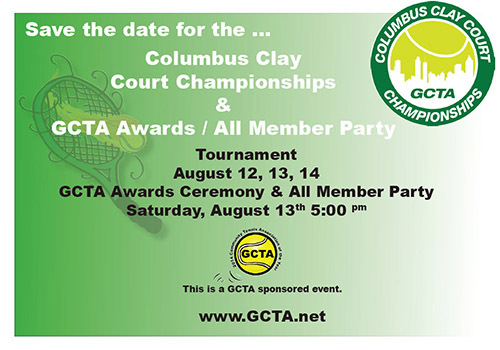 The Columbus Clay Court Doubles Championship and GCTA Membership Party is right around the corner. The tournament takes place from August 12 to 14. The GCTA Membership Party is on August 13 at 5:00pm. The deadline to enter is August 5th. There will be six women's and seven men's divisions to accommodate a wide range of skill levels. Click to register now. Note that both doubles players need to register by August 5th. 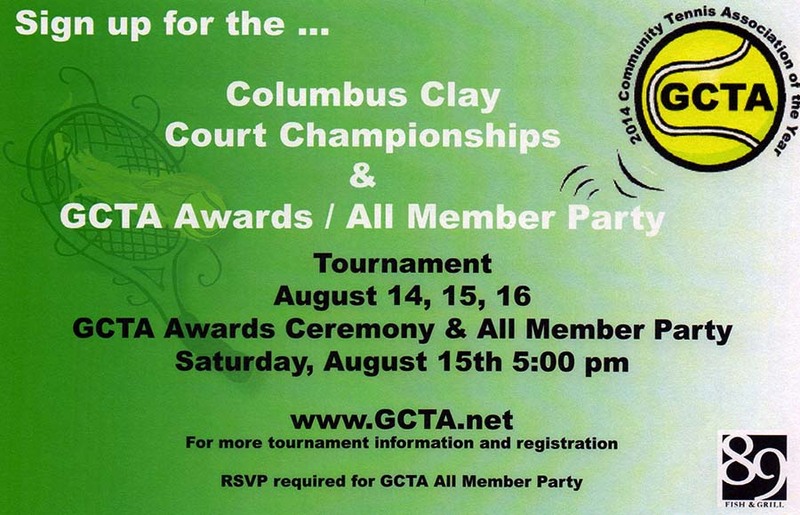 The GCTA Membership Appreciation Party and Awards Ceremony will follow tournament play on Saturday, August 13. Click on Contact to RSVP for the party. Again, please register by August 5th. Registration is now open for the spring/summer session of the USTA Flex League. This singles league offers flexibility to those players who cannot commit to the same day and time every week. 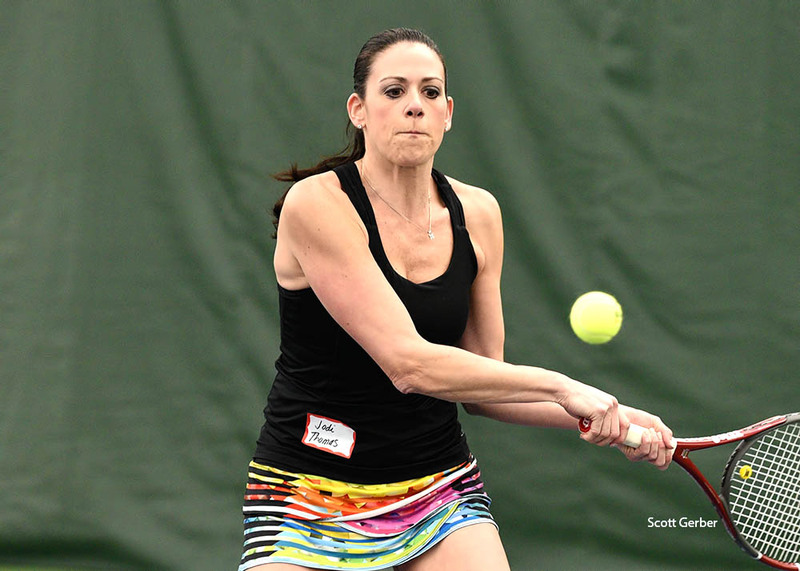 For more information about the Adult Flex Leagues, click to view the USTA pdf document. 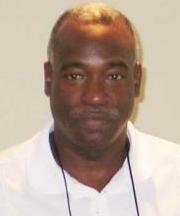 The GCTA lost one of our stalwart members on April 10. John Campbell succumbed to cancer after a long and valiant fight. Through the years John had contributed much to the Columbus tennis community, and was recognized with the 2006 Promotion of Tennis Award. 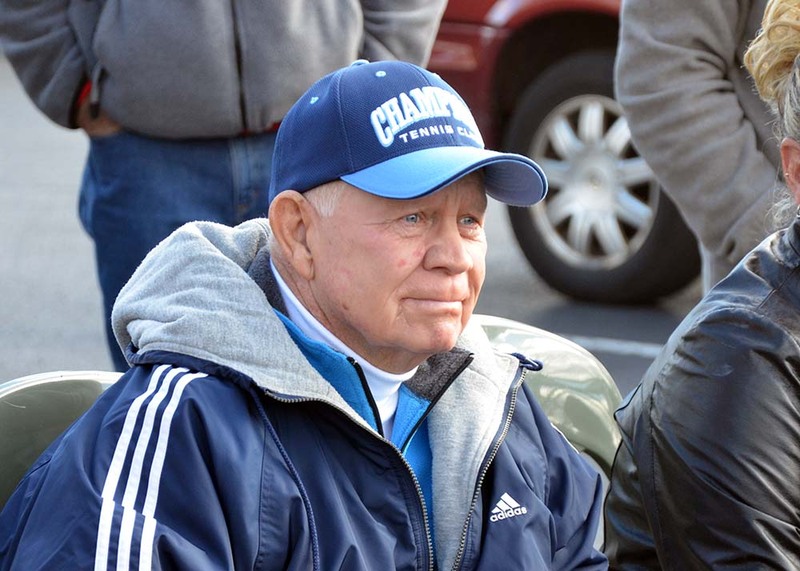 John was an integral part of the creation and maintenance of the Champions Tennis program. This facility was renamed in 2015, The John Campbell Tennis Center in his honor. John’s energy and enthusiasm will be missed. John W Campbell, of Westerville, Ohio died peacefully after a courageous fight with cancer on April 10, 2016 at the age of 77. Survived by wife, Betty, son Kyle (Cindy); daughter Lisa; stepchildren, Terri (Scott), Kim (Tom), Pat (Cheryl), Mike (Jenny), 14 grandchildren and 5 great-grandchildren; siblings, Brenda and Wayne; and numerous friends. Preceded in death by his parents John & Orpha Campbell. John was born in Logan, Ohio on January 11, 1939 and graduated from Otterbein University in 1962 with a degree in Education, where he was a member of the Country Club Pi Kappa Phi Fraternity. John was a Teacher in Central Ohio for 30 years until he retired to be able to spend his time doing the things he loved. He was an avid tennis player, active and dedicated member of the Westerville Lions Club, a 40 year OHSAA Referee, and was also a 45 year member of the American Baptist Church of Westerville. 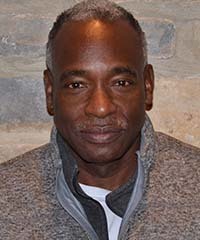 He enjoyed volunteering his time for numerous organizations including Otterbein O Club, The Central District Basketball Tournament and Champions/Olympic Tennis Club. He shared a love for all sports, playing, coaching, and refereeing, watching, and ruthlessly rooting for the Yankees and Bengals. From his outgoing personality and love of people, John had never met a stranger. The family would like to thank the staff from the Ohio Health Hospice Center and everyone involved at the Kobacker House in Columbus. Friends may call at the MORELAND FUNERAL HOME, 55 E. Schrock Road, Westerville, Thursday 2-4 and 6-8 p.m. Service will be held at American Baptist Church, 401 E. Schrock Road, Westerville, Friday at 11 a.m.. Interment Forest Lawn Memorial Gardens. Contributions may be made to Otterbein O Club or Westerville Lions Club. 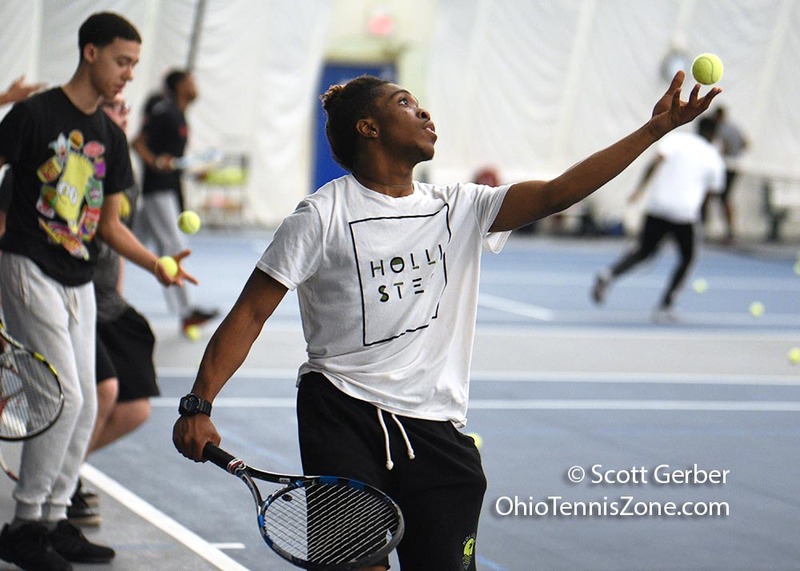 USTA League Tennis provides adult recreational tennis players throughout the Columbus area with the opportunity to compete against players of similar ability levels. Be a part of a team. Meet new people. Play new opponents. Participate in competitive tennis. Travel to matches and championships. Challenge and improve your game. Have fun! 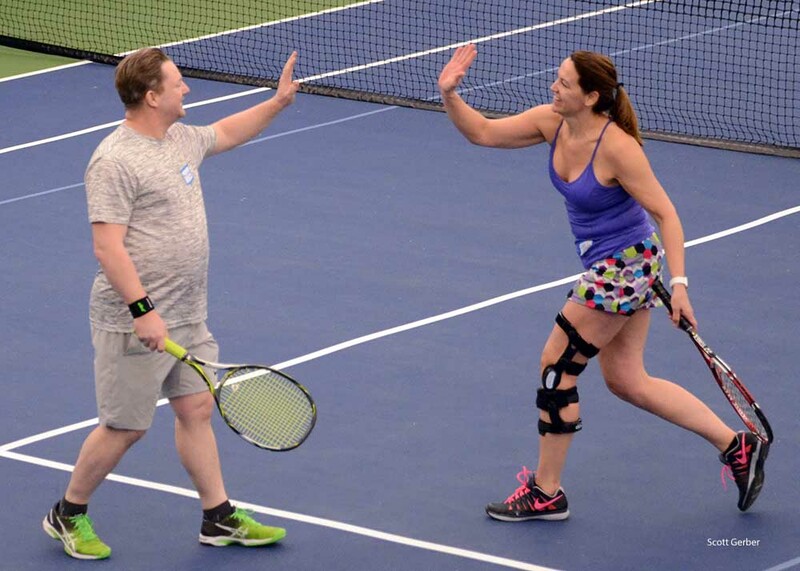 For more information about the Summer Adult Leagues, click to view the USTA pdf document. The Inaugural Columbus Clay Court Championship tournament and Awards Ceremony was blessed with beautiful weather and great tennis competition. One hundred and three teams participated in the three day event held at Brookside Country Club in Worthington, OH. Complete tournament results are listed below. Click on Photos to view pictures from the event. On Saturday evening the GCTA All Member Party/Awards Ceremony highlighted the weekend events. 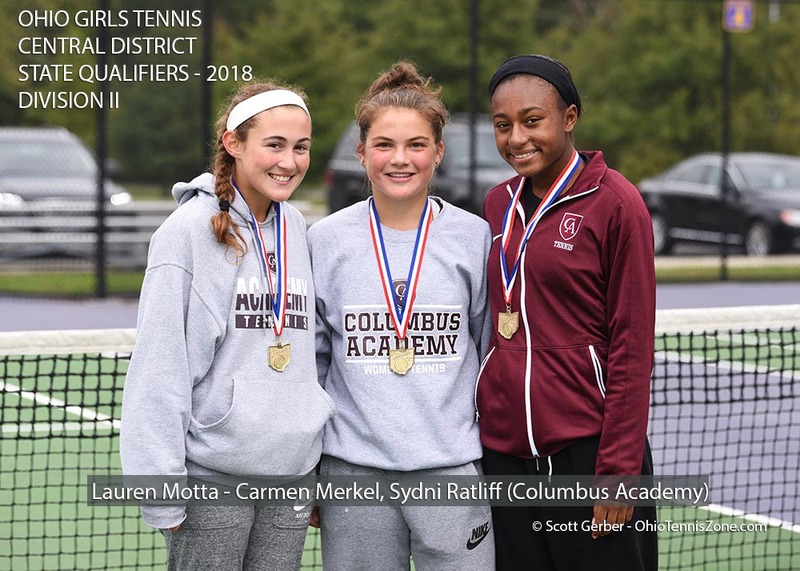 The Greater Columbus Tennis Association (GCTA) award recipients for this year are: Jacob Wareti (top junior boys player), Kyra Jung and Audrey Berger (top junior girls players), and Dave Purpura (Media Award Winner). Columbus Academy's Wareti was the D2 finalist at States. 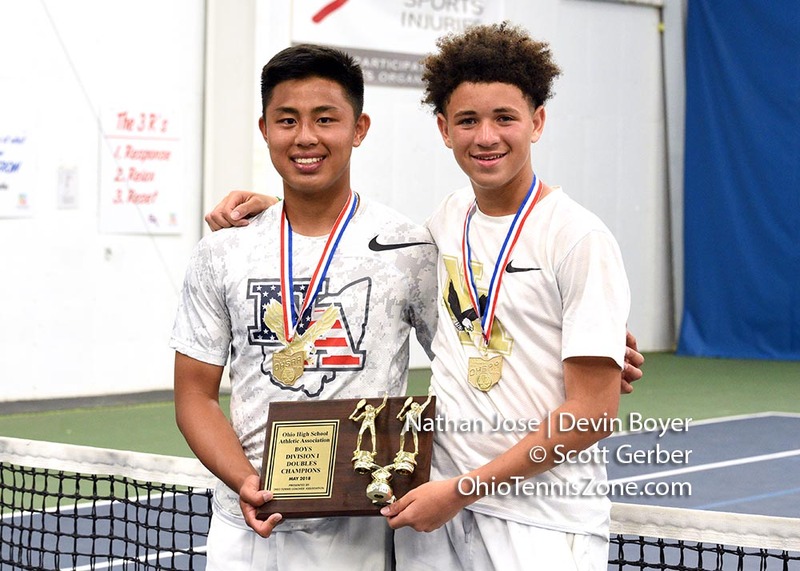 Upper Arlington's Jung and Berger won D1 States Doubles. Purpura is a sports reporter for ThisWeekSports. Congratulation to this year's award winners. 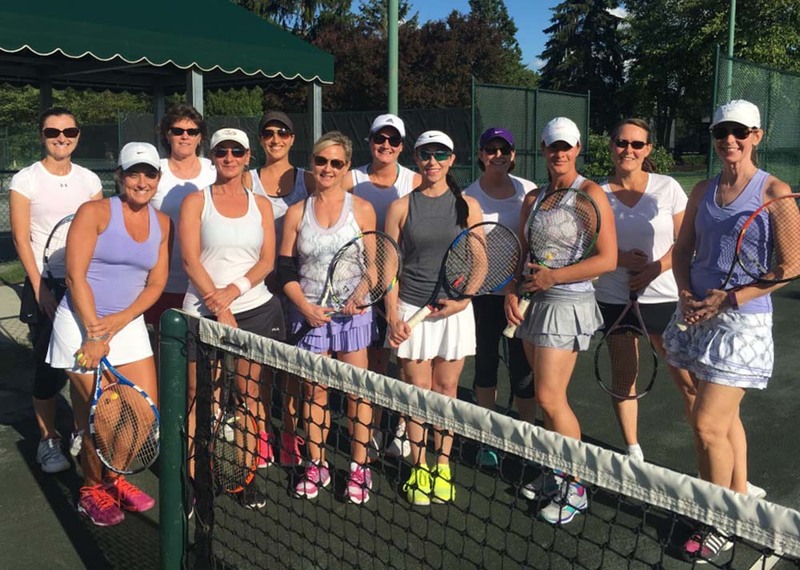 The weather was hot, but sunny as 50 women's and 53 men's doubles teams competed in the first annual GCTA Clay Court Championships. In the marquis events, Philip Diaz Jr. and Joey Frank won the Men's Open Championship by defeating Luke Buchanan and C.J. Martin in the finals. In Women's 4.5, L.Brown and L. Reisz won the three team, round-robin tournament. Click on the links to the right to view the results for all of the tournaments. Just about every Saturday morning in the summer for the past 20 years, Ed Amos can be found on the Wolfe Park tennis courts. Hundreds of young tennis players have passed through the “doors” of his Ace with Love program. Ace with Love focuses on tennis fundamentals and player development by stressing proper nutrition, exercise, self-respect, respect for others, good sportsmanship, anger management and academic excellence. Saturday’s celebration of Coach Ed’s 20 years of service to this community brought many of his former tennis players and parents to Wolfe Park to say thank you to the man who was their coach, their friend, their mentor. In return, Coach Ed thanked the many coaches and volunteers who make this program possible. The GCTA is a proud supporter of the Ace with Love program and Coach Ed Amos. Here’s to 20 more years! 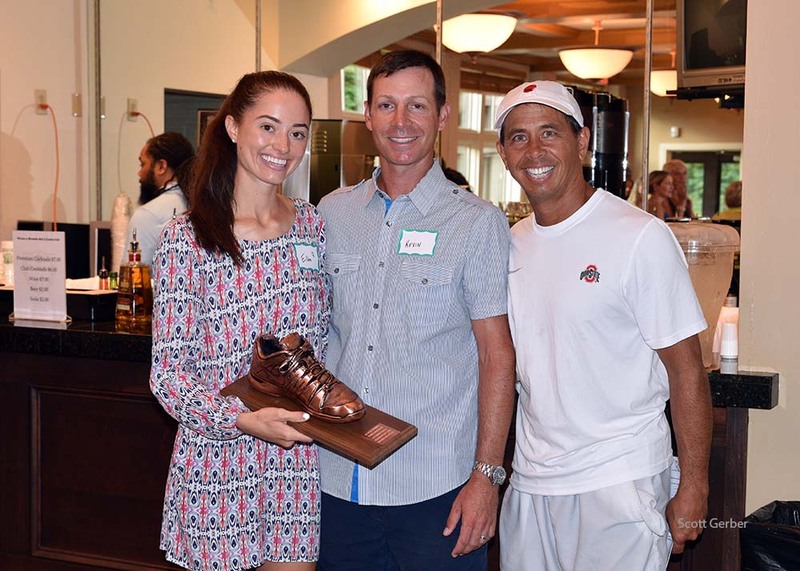 As many of you know, The Greater Columbus Tennis Association was named the United States Tennis Association’s Community Tennis Association of the Year. 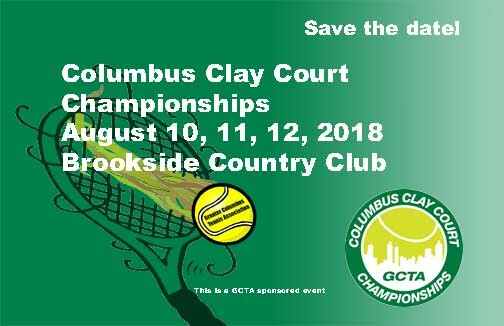 Come help us celebrate this great honor at “The Inaugural GCTA Columbus Clay Court Championships” to be held August 14th-16th at Brookside Country Club, and the all-member party on Saturday, August 15th. 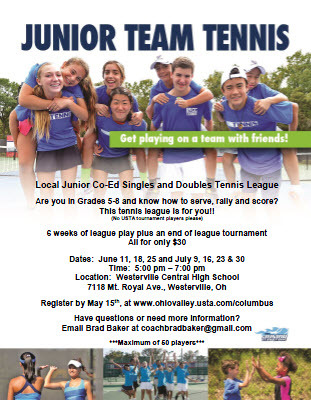 The tournament will also include a year-end party for all GCTA members to showcase Columbus tennis at its best. This event party is to thank all GCTA members and to show our members all the great things the GCTA does all year long and how your contribution impacts so many people. The party will be held at Brookside Country Club, 2770 West Dublin Granville Rd. Columbus 43235, on Saturday August 15th at 5pm, and will include complimentary hors d’ oeuvres and a cash bar. Click to read all of the details and to register. 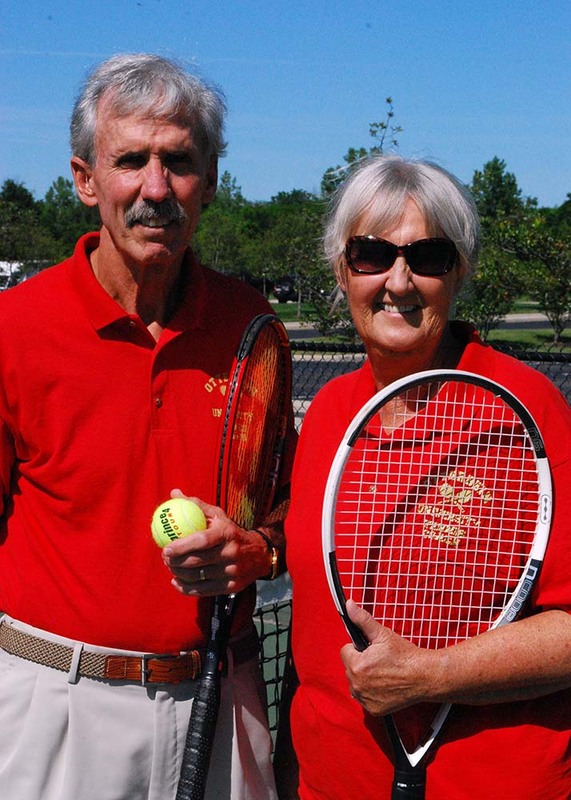 The Columbus Dispatch recently published an article about the Champions Tennis Club. 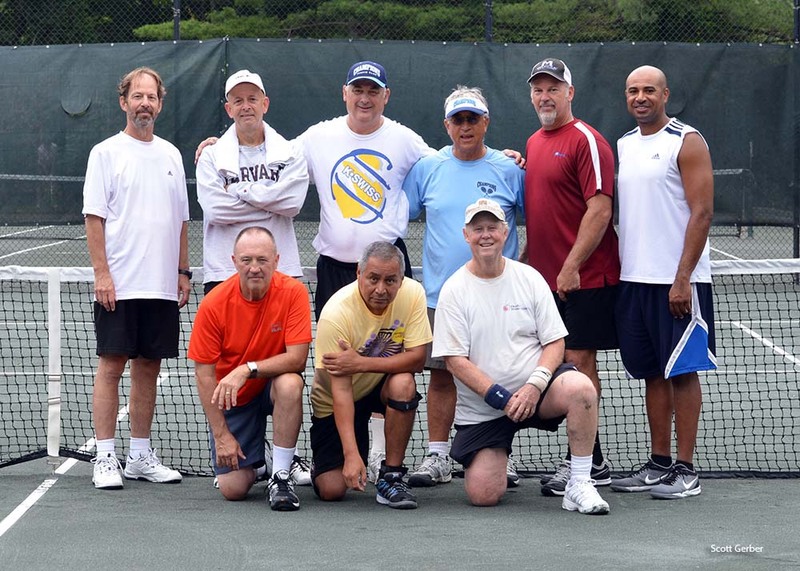 Click to read the article titled, "Tennis club members maintain claycourt tennis center". Every morning of the week you will find avid tennis players hitting the ball at the club's location on 3900 Westerville Road. For more details about the club, click on Champions Tennis Club. Registration is now open for the July / August session and the deadline to register is 12 midnight on Tuesday, June 30th. 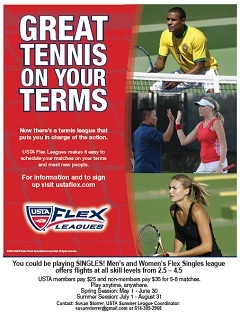 For more information about the Flex League and to complete the registration process, click on www.ustaflex.com. Buddy Up Tennis, Inc. will host its inaugural Gala Celebration, A Sure Bet, on Saturday, February 28, 2015, 6:30pm at The Vue, 95 Liberty Street, Columbus, Ohio. 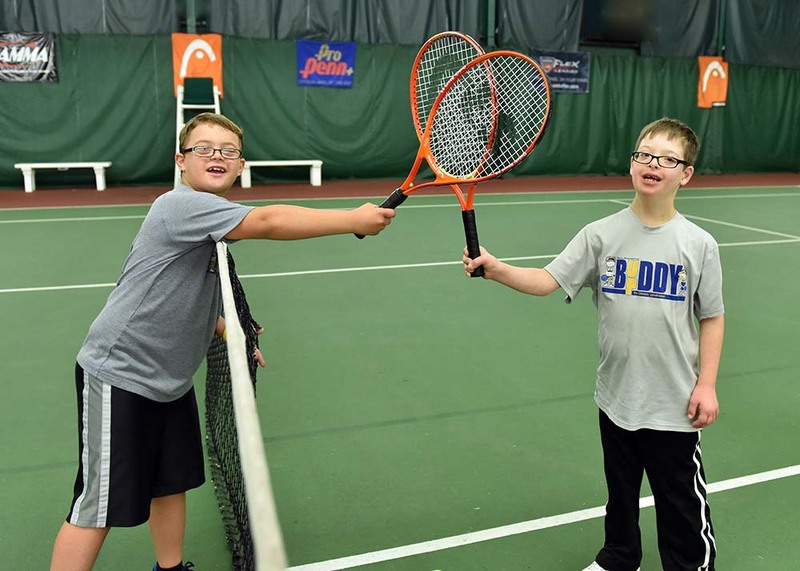 Proceeds from the Vegas-themed event will directly benefit Buddy Up Tennis, Inc., a non-profit organization which provides individuals with Down syndrome with a weekly adaptive program focused on tennis, fitness and fun in 11 cities across seven states. The evening will begin with a cash bar reception where guests will have the opportunity to enjoy exciting casino games, bid on unique silent auction items, and mingle. The reception will be followed by dinner and an informative program which will share the highlights, accomplishments and future plans for Buddy Up Tennis, Inc. The special guest emcee for the event will be Sunny 95’s morning Disc Jockey Dino Tripodis. The event is sold out, but donations may be made online via the Buddy Up Tennis website – www.buddyuptennis.com. Buddy Up Tennis was founded by GCTA Board Member, Beth Gibson. On September 20th, the GCTA hosted a videographer sent by the United State Tennis Association (USTA). His task was to create a 2+ minute video to show at the November 8th awards presentation to inform the crowd why we were selected as the 2014 Community Tennis Association of the Year. To get the full picture of our organization, the crew visited Wickertree Tennis Club to video the Buddy Up Program which has been supported by GCTA grant funds since its beginning. Next stop was Scarborough Tennis Club to talk with Ed Amos about his Ace with Love Program, also a GCTA grant recipient. Northam Park was the scene of Men’s and Women’s tennis matches which were used as a backdrop to illustrate our robust summer leagues. Racquet Club and the Whetstone Park courts were also featured in the short film. The finished product left no doubt as to the depth and breath of the GCTA and the Columbus tennis community! 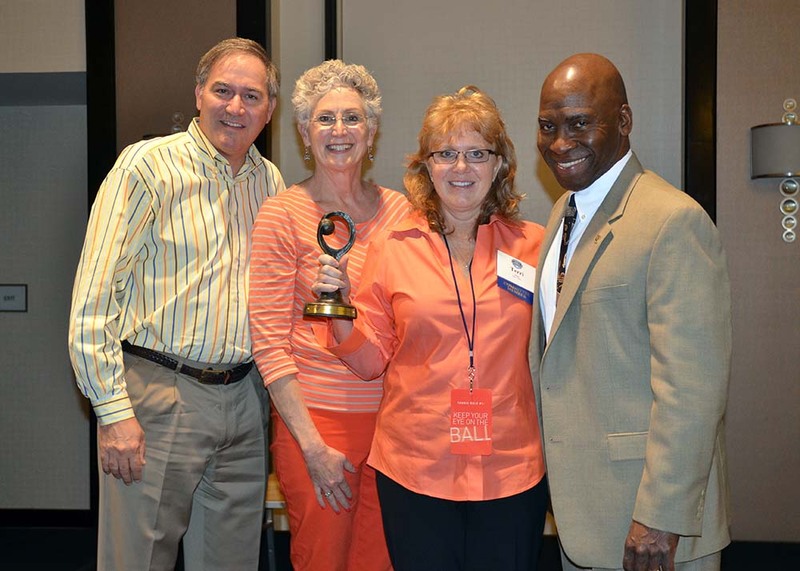 The Greater Columbus Tennis Association (GCTA) was honored as the 2014 Community Tennis Association of the Year at the USTA’s annual Tennis Development Workshop in Atlanta, GA, on Saturday, November 8th. 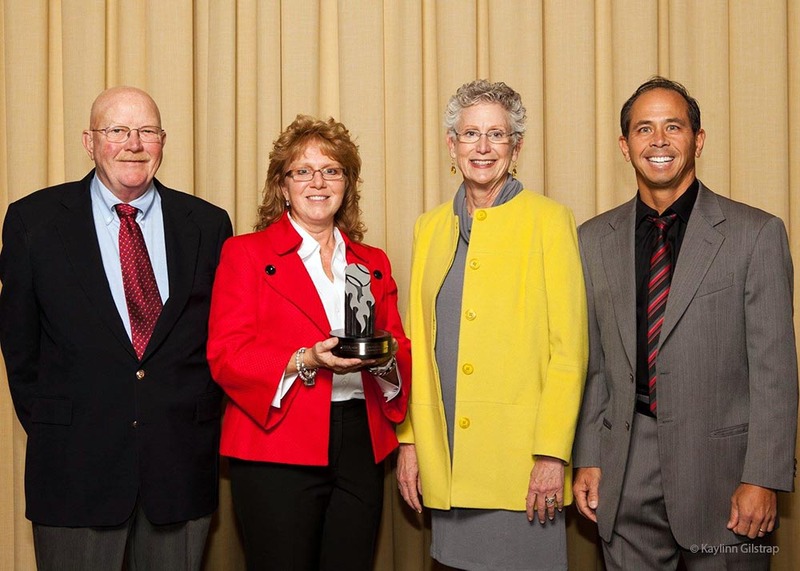 Receiving the award on behalf of the GCTA were (from the left) Vice-President Jim Scowden, Executive Director Terri Jones, Shelby Rhyne, and President Phil Diaz. Buddy Up Tennis continues to grow thanks to the efforts of Columbus' Beth Gibson and a great group of volunteers. 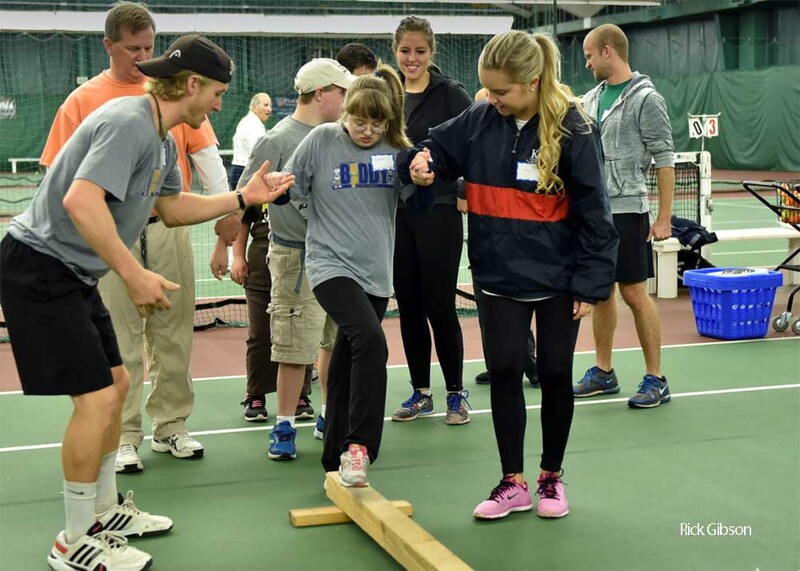 The program, which provides tennis instruction and play for those with Down Syndrome, has expanded to eight U.S. locations. Click to read this article from the USTA Foundation. Beth is also a GCTA Board Member. 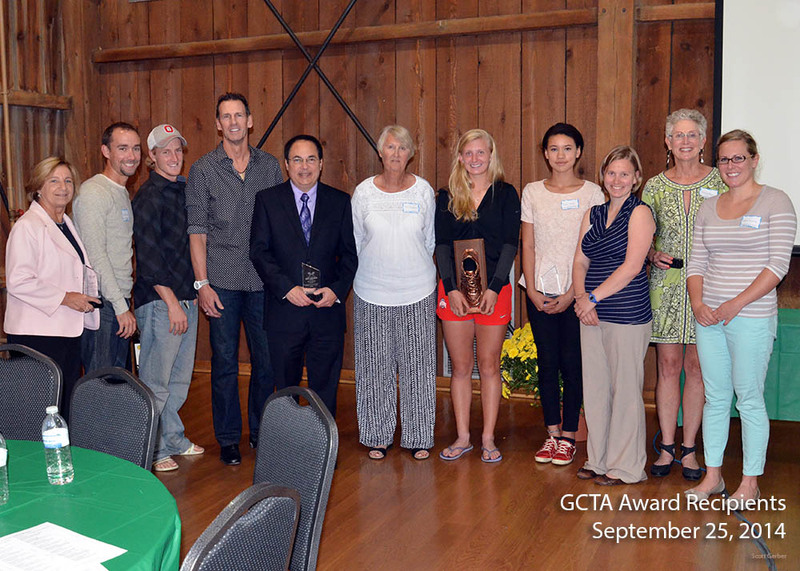 On Thursday, September 25, 2014, the Greater Columbus Tennis Association (GCTA) held its annual awards ceremony. 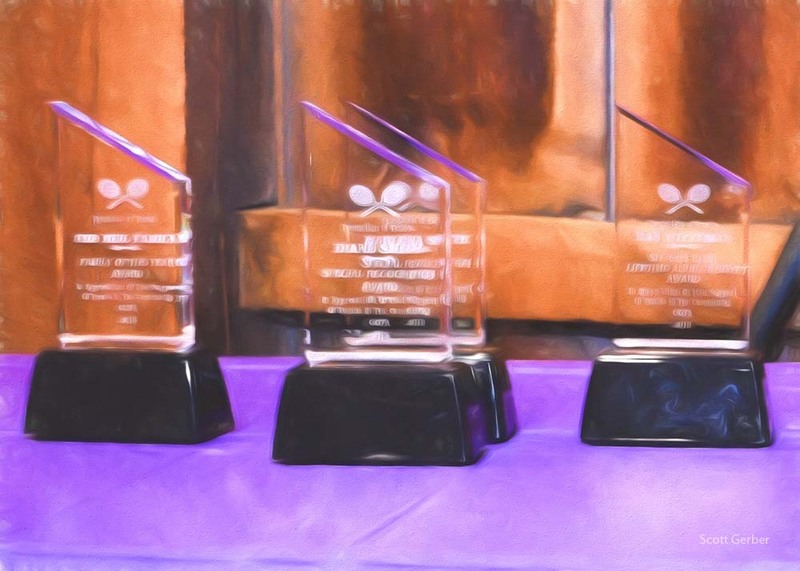 This event honors individuals in our area for their outstanding contributions to the Columbus tennis community, as well as the Men’s & Women’s Summer League champions. This year’s award recipients were Pam Brady (Special Recognition), Buddy Up Tennis Coaches (Special Recognition), Pat & Mark Anderson (Special Recognition), Shelby Rhyne (Promotion of Tennis), Fred Levy (Promotion of Tennis), Ben Gelber (Media), India Carter (Columbus Recreation & Parks), Jeffrey Melvin (Male Junior Player of the Year), Anna & Alexandra Sanford (Female Junior Players of the Year). Congratulations to these award winners. Concluding the ceremony, Joy Albi, from the USTA Midwest Section office, presented the GCTA with the USTA’s Community Tennis Association of the Year Award. 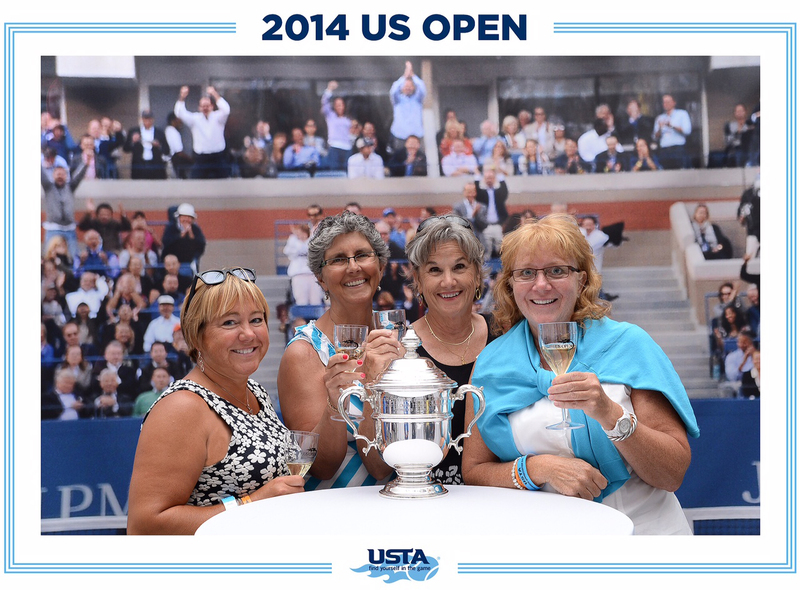 The GCTA was represented at the US Open on Friday, August 29, by Executive Director, Terri Jones, Board Members, Jane McMeekin, Shirley Neibauer, and Erin Ortman. The GCTA representatives were invited to spend the Day Session in the exclusive President's Suite watching the Jankovic, Venus Williams, and Berdych matches from second row seats. 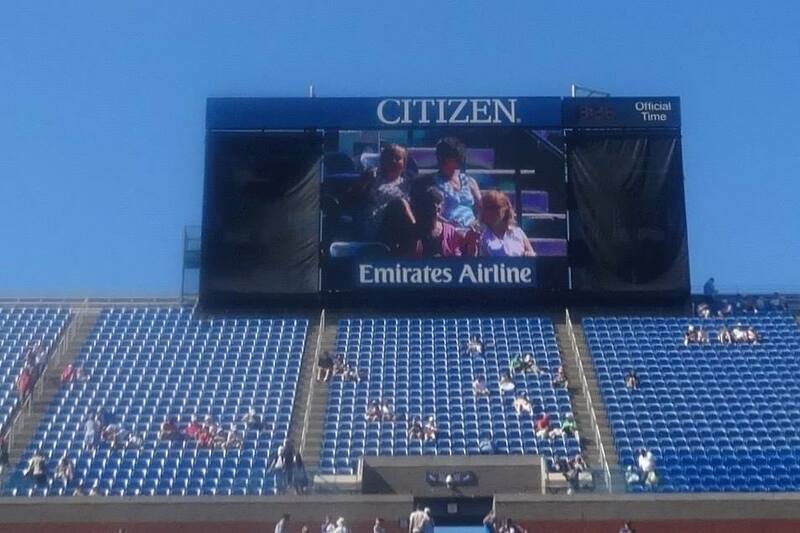 Between the second and third matches of the day, the USTA announced the GCTA as the Community Tennis Association of the Year and showed the ladies on the jumbo scoreboard. It was a very exciting and rewarding day. 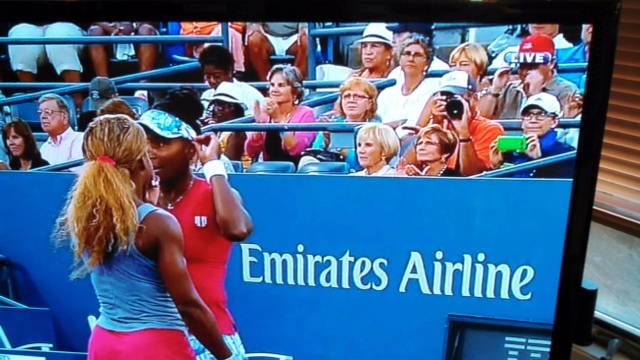 We were treated as valued guests throughout the day and saw outstanding tennis. Jim and Kim Hendrix shared the excitement with us after we left the President's Suite and treated us to a glass of champagne to celebrate our honor. Thanks to all the hundreds of GCTA volunteers who made the award possible and to the Executive Committee for selecting the four of us to attend the Open. 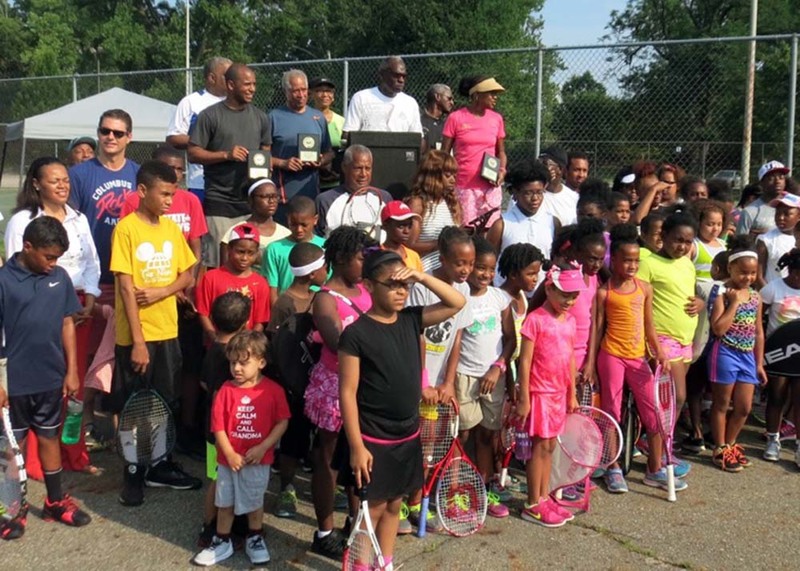 The USTA announced that the GCTA was selected as the 2014 Community Tennis Association of the Year. According to the press release, the GCTA has promoted the game of tennis as a healthful recreation and physical fitness in Columbus. Click to read the full press release from the USTA. This spring Otterbein University saw both its men’s and women’s tennis teams winning their respective OAC Tournament Championships. By winning the tournament, both teams qualified for the Division III NCAA tournament. 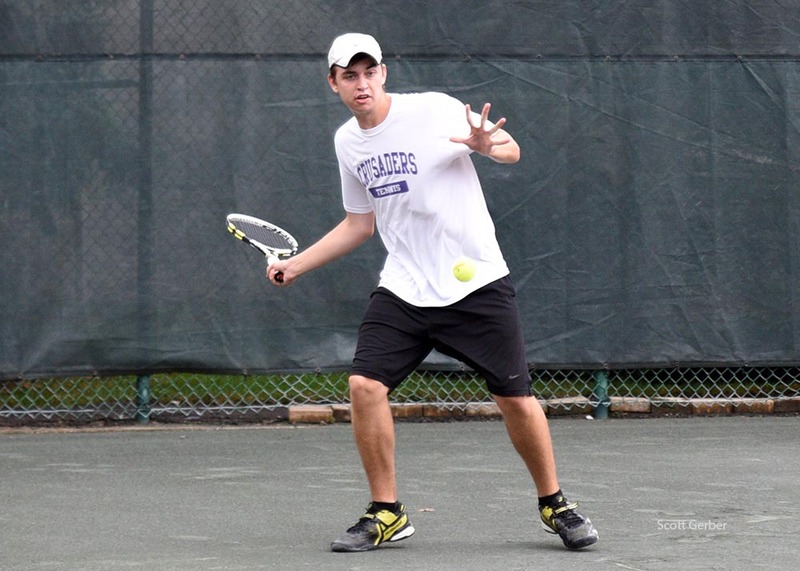 This is the first time in school history that the tennis programs have made NCAA appearances. The Otterbein men’s team is coached by GCTA board member Mark Anderson. The women’s team is coached by his wife (also a GCTA board member), Pat. The Otterbein University men's tennis team dropped out of the NCAA championships, losing in the second round, 5-0, to fifth-ranked Carnegie Mellon University Saturday in Monroeville, Pa. The women's tennis team ended its season with a 5-2 loss to Trinity University in the first round of the NCAA championships hosted by the University of Mary Washington. Following this record setting season, four members of both the men's and women’s teams received All-Ohio Athletic Conference (OAC) honors for their performances throughout the season. In addition to the honors earned by the athletes, head coach Pat Anderson was named OAC Coach of the Year for the fourth time in her career. Anderson earned the honor last season and also in 2003 and 2001, and head coach Mark Anderson was named OAC Men's Tennis Coach of the Year, a first for him in his six-year career. 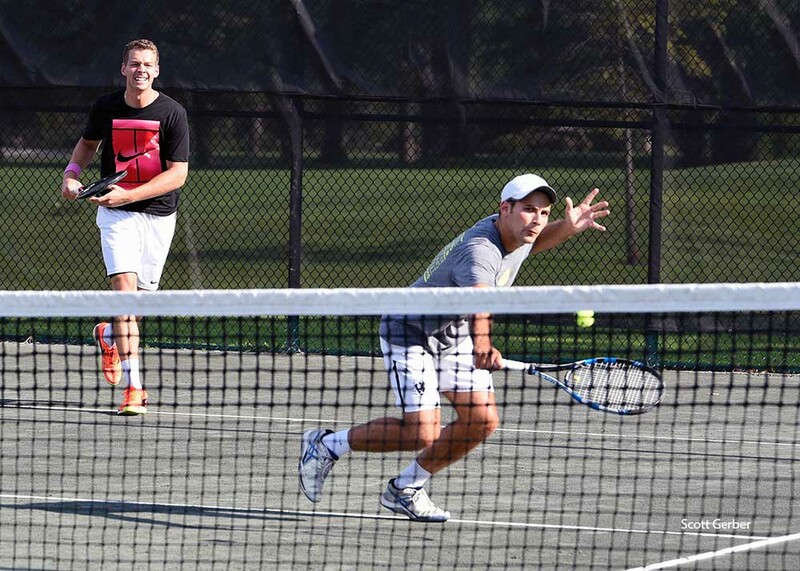 Click to read Mark Znidar's Columbus Dispatch article, "Otterbein tennis: Coaches' competitive spirit a perfect marriage". Do you know someone in your tennis world who is making a difference? A coach who goes the extra mile; a student who creates a unique tennis opportunity; a community leader who starts a new tennis program; a family who is "all-in" on the court; an individual who "makes "your club a special place; a media outlet who is covering our sport; or a longtime leader in our tennis world? Please consider nominating this person for an upcoming GCTA Annual Award. Please click on the link below to find the nomination form on the GCTA Awards page. You will also find the names of former award winners and copies of programs from previous Award Ceremonies. Please fill out a nomination by Monday, July 7. Return the attached form to: Terri Jones, GCTA Executive Director via email: tj3535s@yahoo.com. Again this year, the GCTA Ohio Valley Cup team won the Ohio Valley Cub Championship. Back row (l-r): Coach Steve Metzmaier, Eric Hunter, Bryan Yoshino, C.J. This makes the fourth year in a row that the team has brought the honor back to Columbus. The team won the Ohio Valley Cup by going 3-0 in team matches. Columbus defeated Charleston 9-1, MOVTA (Mid Ohio Valley Tennis Association) 10-0, and Cincinnati 10-0. Overall the team was 29-1 on the weekend. Congratulations to the team and their coaches for another outstanding performance. 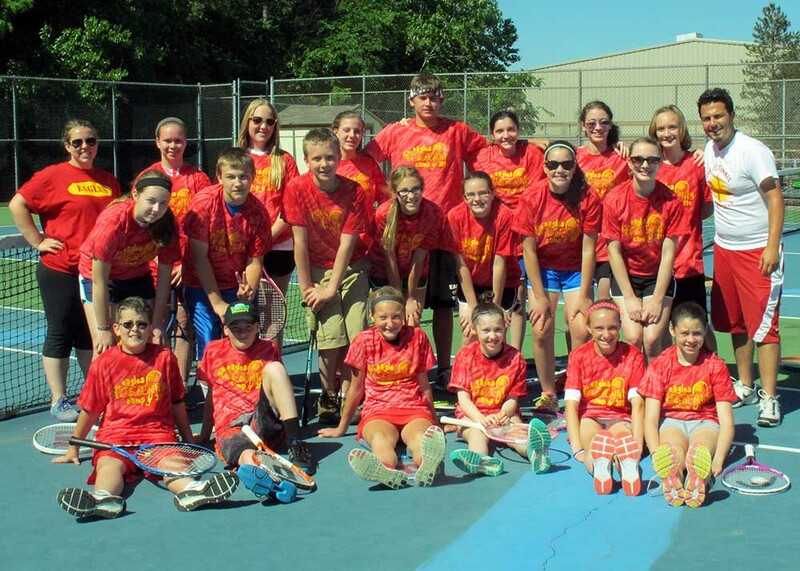 GCTA Grant money was put to good use last week at the Eagle Summer Tennis Camp at Big Walnut High School in Sunbury, OH. Kids in grades 4-8 were engaged in drills, games, singles and doubles play. 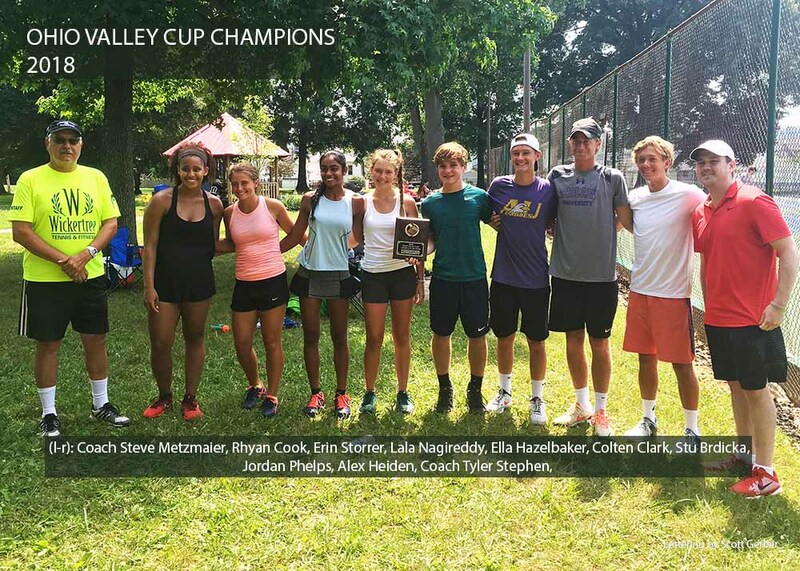 Coach Ryan Balaz called the program a “huge success” and hopes to see tennis in Sunbury area grow through camps like the annual Eagle Summer Tennis Camp. Click to read more about Acquiring a Grant for Your Tennis Program. 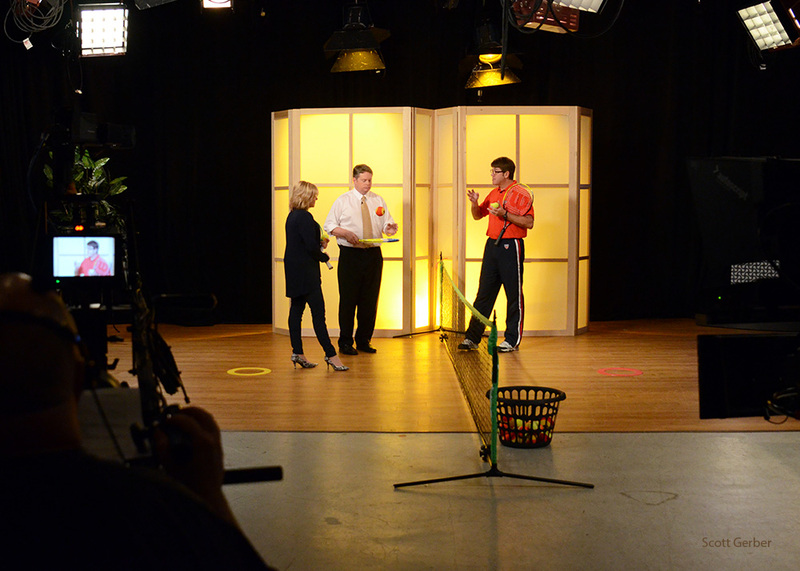 Tennis in Columbus was highlighted on Thursday, May 22, when Jim Amick, our USTA Midwest Tennis Service Representative, appeared on WTTE’s Good Day Columbus’ 9:00am segment. In the few short minutes that tennis was featured, Jim managed to mention many of the USTA tennis opportunities available in the Columbus area, including our Youth Team Tennis, Junior Team Tennis, and Start/Restart programs. Click to view the television segment where Jim is interviewed by WTTE's Shawn Ireland and Marshall McPeek. The USTA/Midwest Section Community Tennis Association of the Year (CTA) Award is presented annually to recognize outstanding service rendered in the community served, and in the growth and development of the sport of tennis. Columbus GCTA board members, Jim Hendrix, Shelby Rhyne,Terri Jones, and Les Varnado were in Indianapolis to accept this prestigious award. The GCTA is now entered into the running for National CTA of the Year. At its April Quarterly meeting the Greater Columbus Tennis Association received a plaque of appreciation from the Columbus Recreation & Parks in thanks for the support GCTA have provided Columbus Parks and Recreation throughout the years. 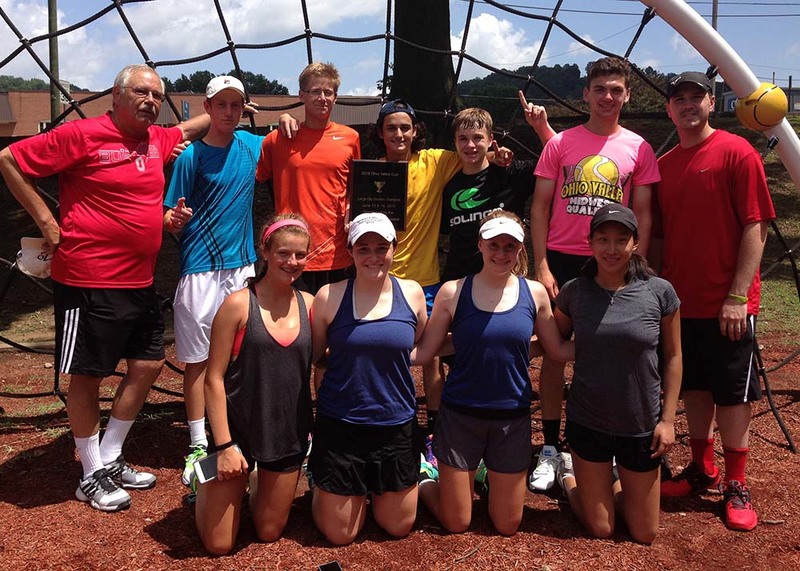 The GCTA yearly budget includes over $13,000 to help fund the CR&P’s tennis programs. The GCTA is proud of its commitment to growing tennis in Columbus. Congratulations to the OSU Men's Team for winning their first ITA Championship. OSU beat #12 Florida, #13 Texas, #1 Virginia, and #3 USC to win the tournament, which took place in Houston. As a result, Ohio State is now ranked #1 in the nation. While it is unusual for a cold-weather school to win this tournament, it is even more unusual given the make-up of the team. 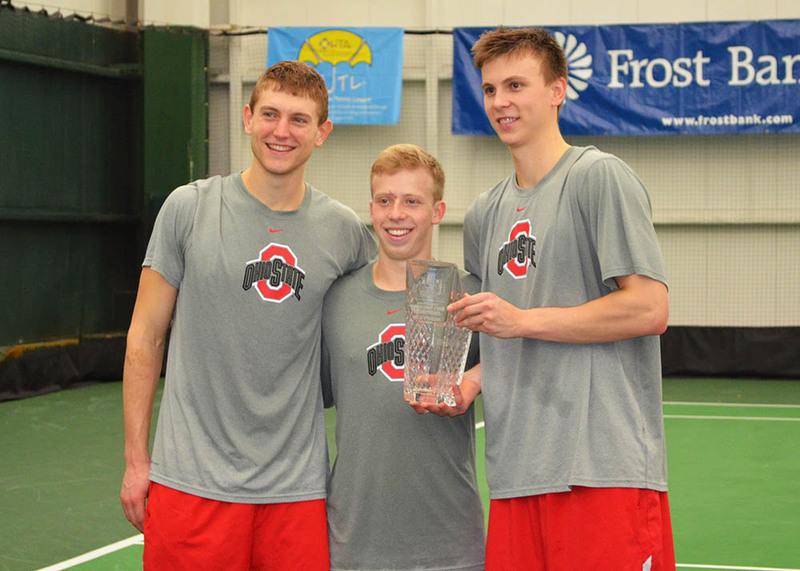 Three players who are on Ohio State's team grew up playing Greater Columbus Tennis Association (GCTA) tennis qualifiers. 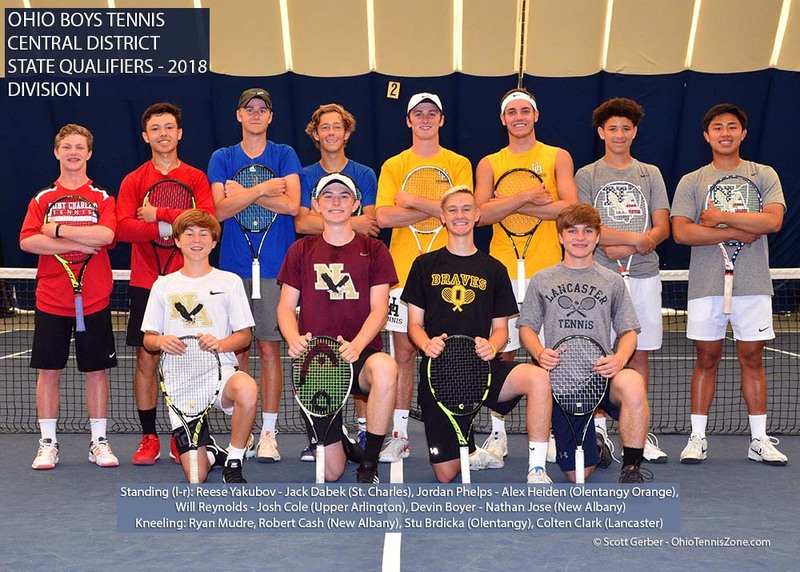 Peter Kobelt, Chris Diaz, and Kevin Metka all competed with and against each other for years in Central Ohio junior tennis. 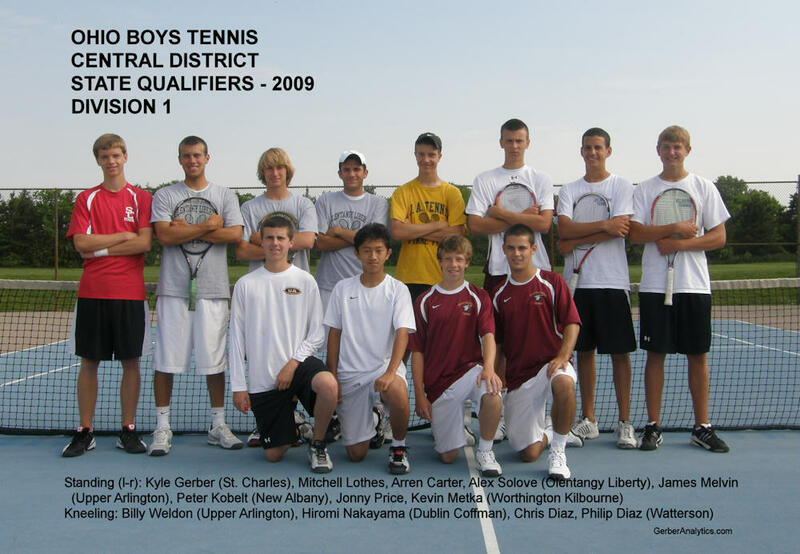 Also note that Kobelt (New Albany), Diaz (Watterson), and Metka (Worthington Kilbourne) played Ohio high school tennis for all four years. This is rare in other states. All three are included in the picture to the right as 2009 Central District State Qualifiers. 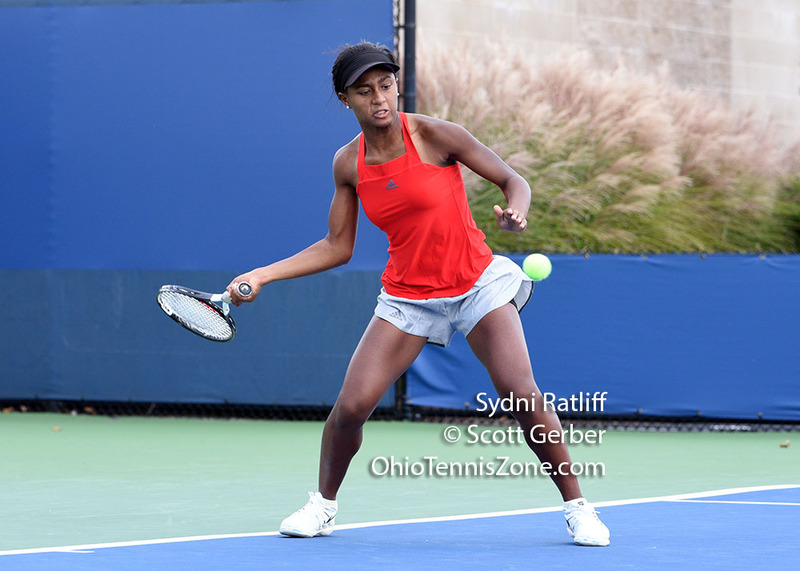 For more information about the tournament, read Colette Lewis' ZooTennis blog, the OSU website, and the Intercollegiate Tennis Association website. Attending an Ohio State tennis match is like a tennis reunion. To watch great tennis and see old tennis friends, click to view the Men's schedule and Women's schedule. Admission is free. It is not too early to be thinking about USTA Summer Adult Leagues - "Find Yourself in the Game". 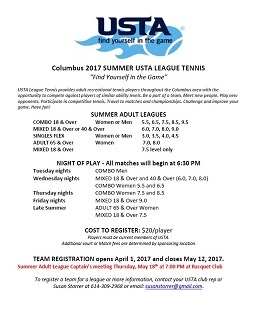 Combo, Mixed 18 & Over, Adult 55 & Over, and Adult 65 & Over leagues play matches in the Columbus area from June until August. FLEX Singles leagues are offered in two summer sessions - June/July and August/September. For more information, click on the following documents. USTA Summer League Tennis Rules and Regulations for 55 & Over, Mixed, and Combo. 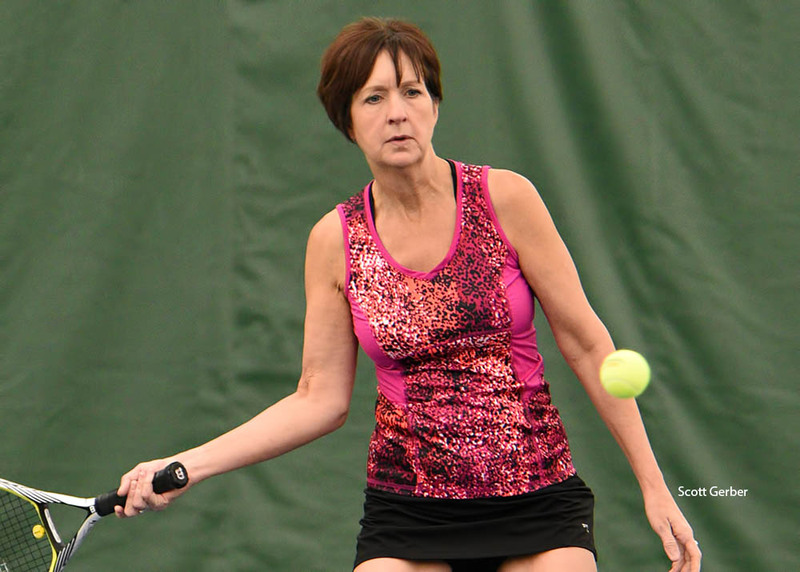 Each month the USTA/Midwest Section features a volunteer who is making it happen at all levels. 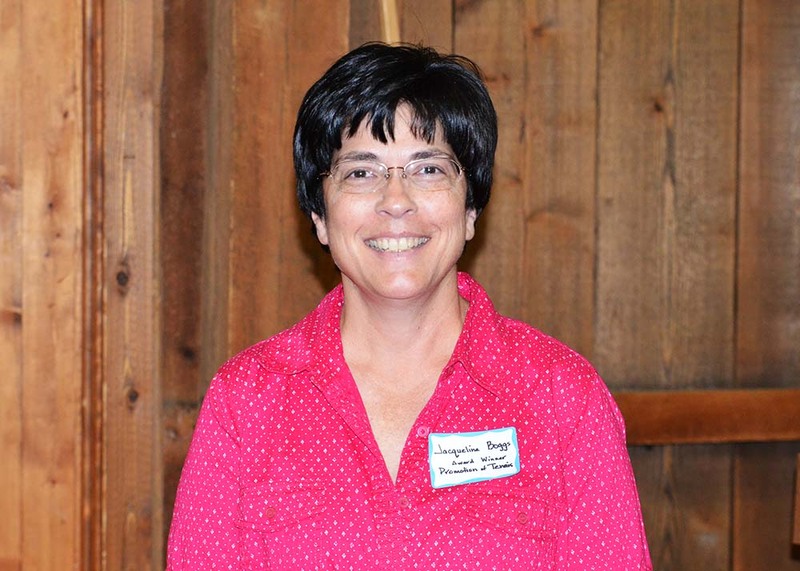 January's volunteer of the month is Jacqueline Boggs of Pickerington, Ohio. A few years ago the USTA envisioned a master program called 10 and Under Tennis, and decided to make it a priority all over the country. There can be no better of example of “how to do it right” than Jacqueline Boggs and her Pick10Tennis program. Starting two years ago, Jacqueline began to play the role of tennis head cheerleader in her community of Pickerington which is a suburb of Columbus. Through Jacqueline’s efforts, hundreds of Pickerington elementary students and after-school program participants are learning how much fun tennis can be! Since most schools did not have tennis courts available, Jacqueline has lined the 10 and Under Tennis court dimensions on her school parking lot so that teachers can use them as tennis courts. Tennis didn’t stop in Pickerington when school let out. 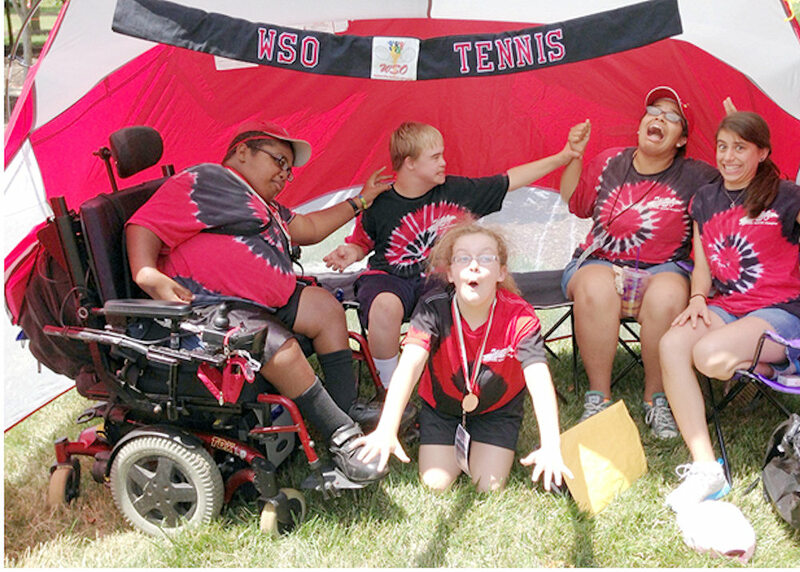 Pick10Tennis organized three Midwest Youth Team Tennis teams, summer camp clinics and offered an Adaptive Youth Tennis Camp and Youth Team Tennis Camps last fall. 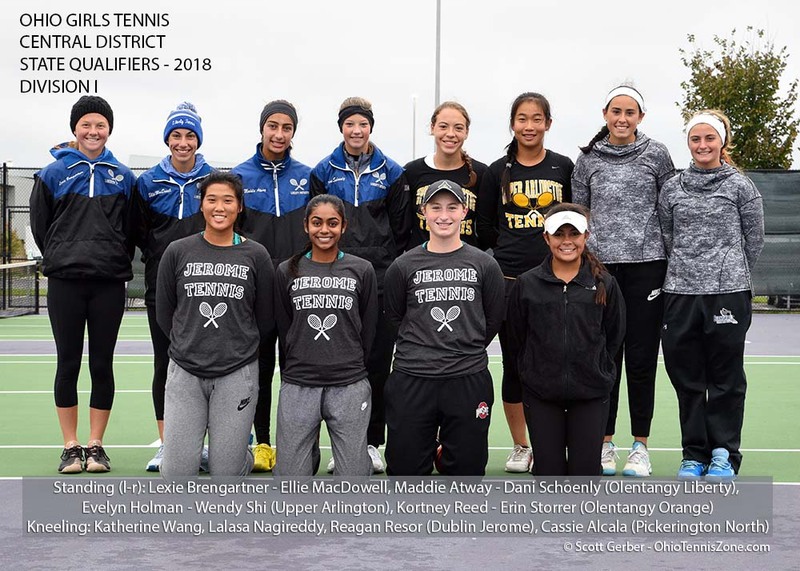 In Jacqueline’s words, “Tennis gives me amazing opportunities to give back to my community, both through the schools and through other venues.” Jacqueline’s efforts in Pickerington will continue to promote tennis for years to come. 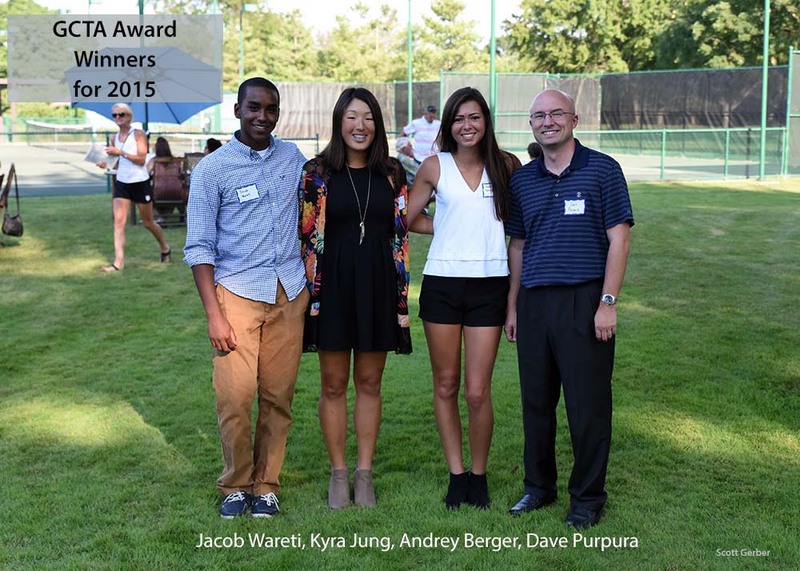 Jacqueline was the recipient of the 2013 Greater Columbus Promotion of Tennis Award. Thank you Jacqueline for all that you do to promote tennis in the Columbus area. 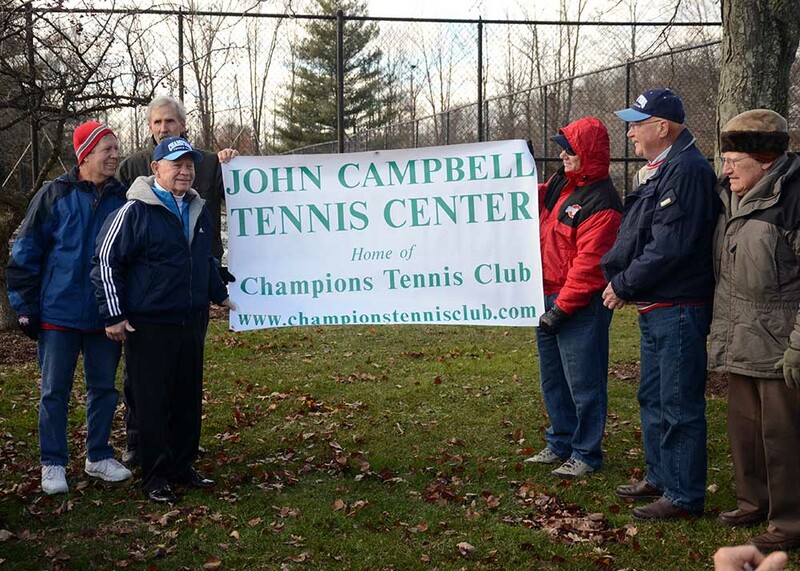 The temperature could not have been much above 30 degrees this afternoon but that did not stop over 50 people from coming to celebrate the naming of the tennis courts at The Champions Tennis Club to The John Campbell Tennis Center. This is a fitting tribute to the man who has been responsible for the impressive resurgence of the club in recent years. Only a few years ago the club was to be closed by the operating entity, Columbus Recreation and Parks. 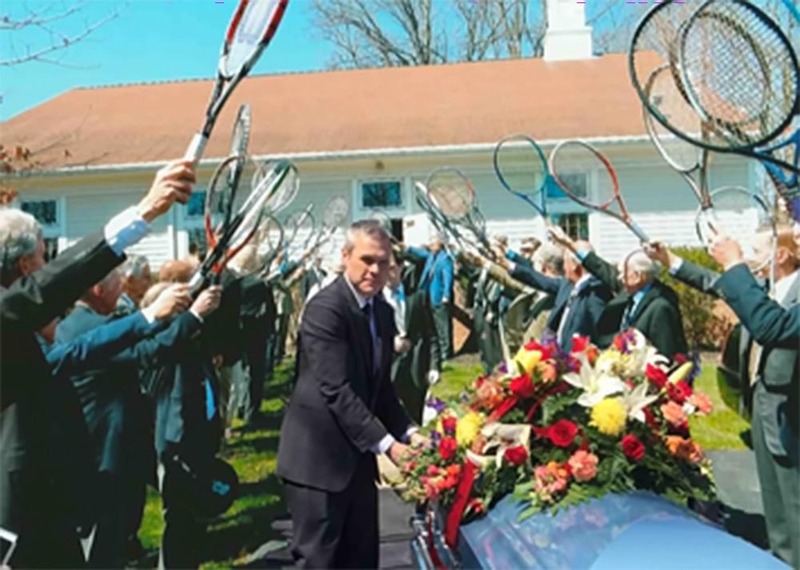 John Campbell spearheaded efforts that led to the courts being taken over by interested individuals who have continued to maintain the courts and organize tennis to this day. Well, no tennis today, but expect tennis to return to the John Campbell Tennis Center in the spring! 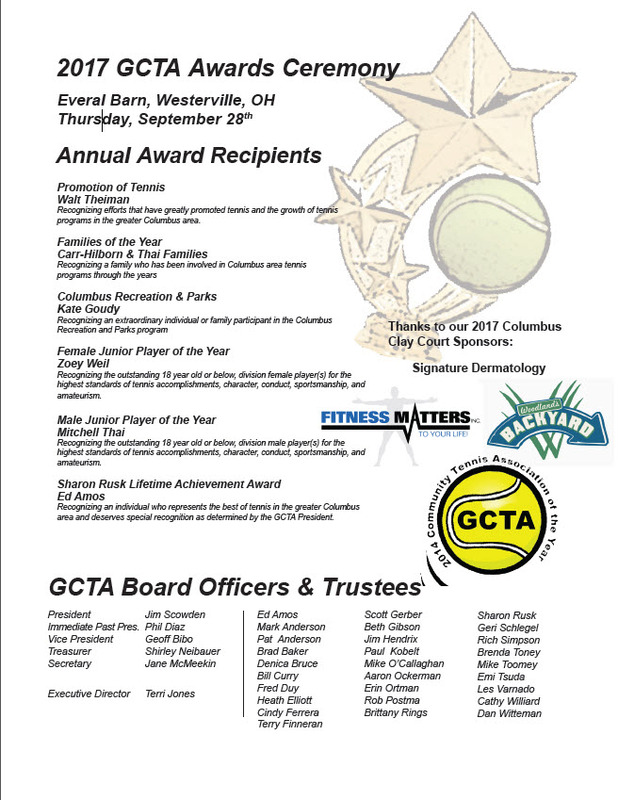 Each year the GCTA Board honors individuals who have significantly contributed to the greater Columbus tennis community. 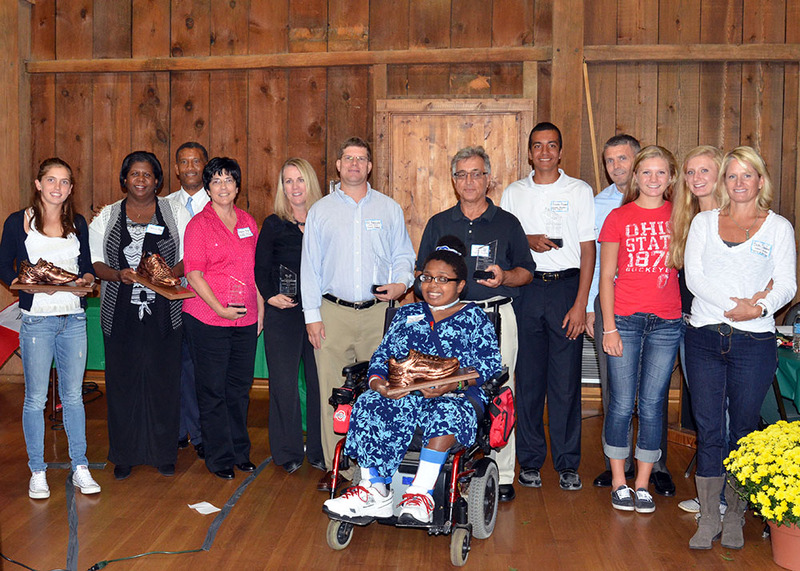 The 2013 awards were handed out Thursday, September 26th at the Everal Barn & Homestead in Westerville. In addition, summer league division champions and runners-up were recognized. Award winners from left to right: Francesca DiLorenzo (Female Junior Player of the Year), Delois and Dimitri Teague, parents of Canyon Teague (Male Junior Player of the Year), Jacqueline Boggs (Promotion of Tennis Award), Mitsi Niceswanger (Promotion of Tennis Award), Bill Rabinowitz (Media Award), May Summers (Female Junior Player of the Year), Sam Arisan (Special Recognition Award), Quentin Pruneau (Columbus Recreation and Parks Award), The Sandford Family – Brian, Alle, Anna, Beth (Family of the Year). Not pictured, Cristina DiLorenzo (Female Junior Player of the Year) & Canyon Teague (Male Junior Player of the Year). Click here to download the program from the the event for more details. 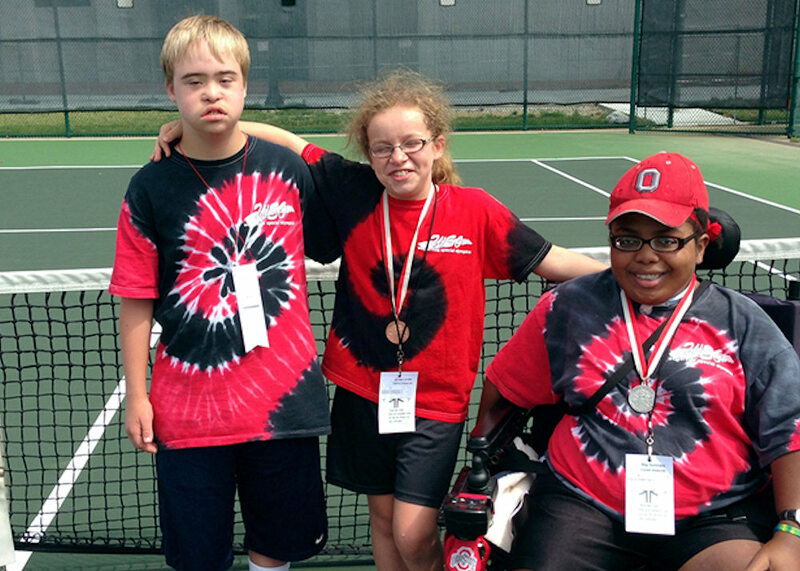 The Westerville Special Olympics tennis program, funded in part by the Greater Columbus Tennis Association was very active this season. Listed below are basic components of this program. YAP (Young Athlete’s Program) –a six week program introduced youth ages 4-7 to the basic skills of tennis. 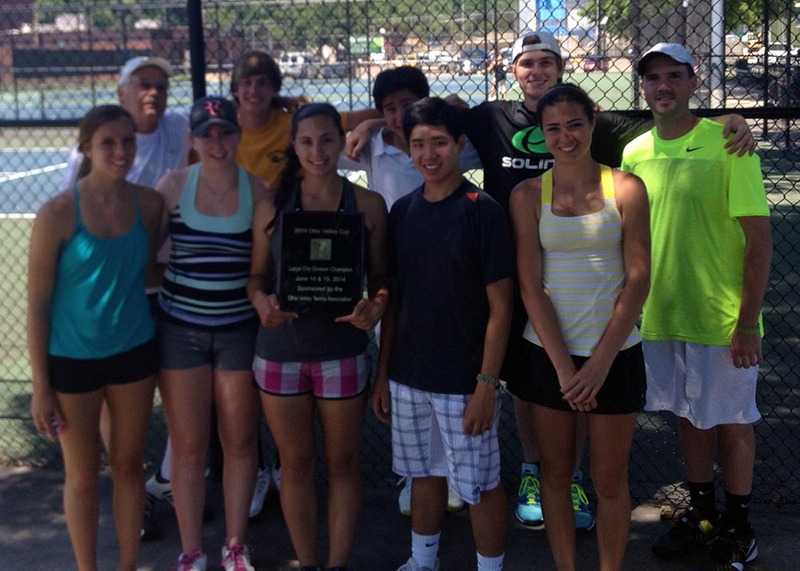 A skills program geared toward our traditional athletes focusing on tennis skills. A weekly program running five months working with athletes who have already gone through our skills program. WSO athletes participated in the Ohio Special Olympics. Included in the above photos are the following players: picture 1: May, Kody, Mocelyn, Marlena Smith (Director), and Amber, and in picture 2: Kody, Jocelyn, and May. Ohio's USTA Tennis Service Representative, Jim Amick, and Good Day Columbus', Dana Turtle, met up with some of our 10 and Under tennis friends at a fun gathering at the Whetstone Park of Roses on June 5th. The kids put on a great display of new games using modified equipment designed especially for kids under the age of 10. With 10 and Under Tennis, kids enjoy playing with balls that bounce lower and move slower through the air, making them easier to hit. Racquets are now sized for small hands, making them easier to grip and swing. Courts are smaller, so kids can cover them and have more success when they play. Kids have more fun—and want to play more often. Tennis is a sport that gets kids moving, improves balance, agility and hand-eye coordination, and can teach self-confidence and self-assurance. 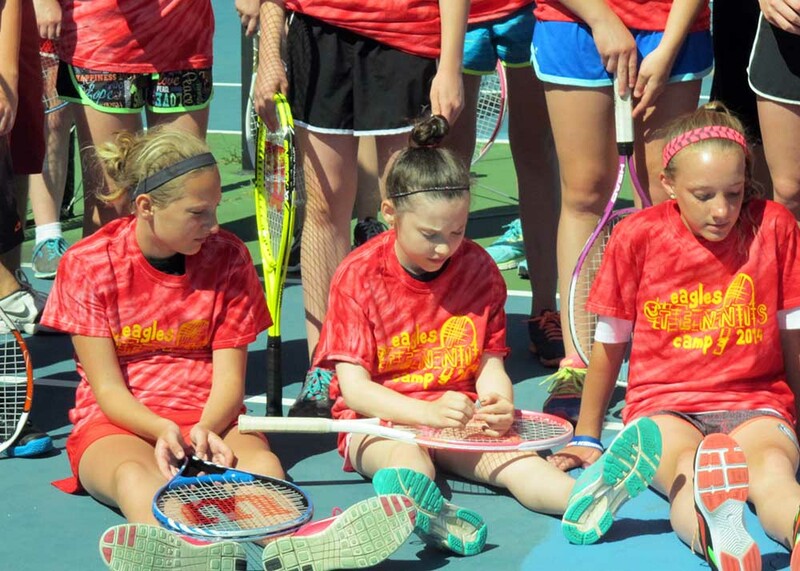 Playing tennis, your child can make new friends in a safe, supportive environment. Your whole family can play together anywhere–driveways, gyms and playgrounds can all be transformed into your very own tennis court. Jim Amick, our Midwest Tennis Service Representative, brought tennis excitement to Annehurst Elementary students on Wednesday, April 30th. 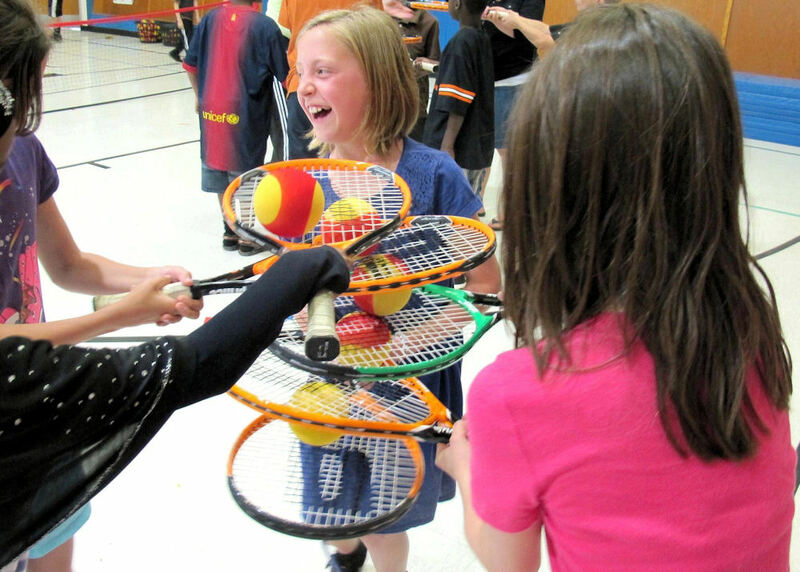 The assembly culminated a four week tennis unit using equipment and teacher training supplied by the Greater Columbus Tennis Association (GCTA). 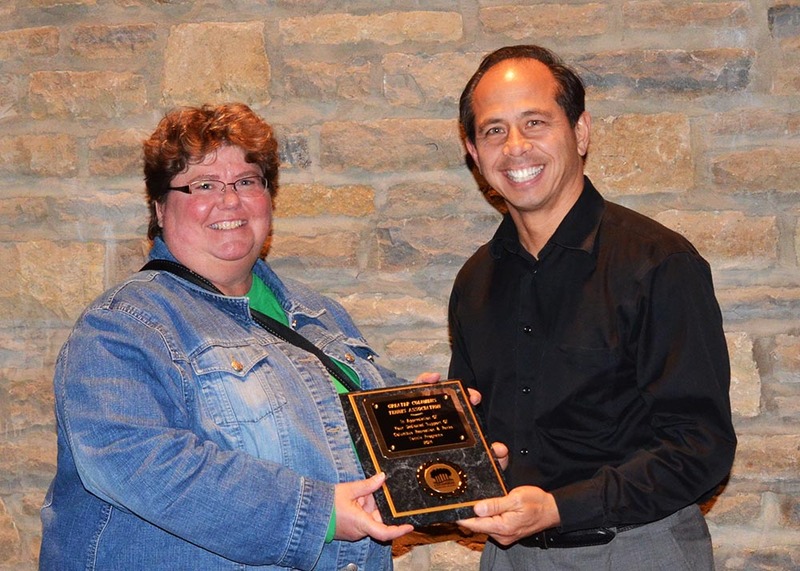 Edwin Amos, of Columbus, Ohio, has been named PTR Member of the Year for the State. This award is presented to a PTR member in the United States who has shown dedication and diligence in promoting and supporting tennis and PTR. Beth Gibson was recently featured in the New Albany Life Magazine for her Buddy Up Tennis and Fitness Program. Beth was also recognized at the DSACO Celebration of World Down Syndrome on March 21, 2013, for her tireless contributions to the Downs Syndrome community. Privacy-Related Information: Google Analytics is used to monitor usage. It uses "cookies" to identify your browser for use in serving ads and tracking your activity. For more information, please visit their site. Please refer to your browser's help files if you wish to alter your privacy settings.